FFTA3 - Site de ffta-online ! 16. Crinipellis minutula (Henn.) Pat. The author wishes to thank Jan Rammeloo, former Director of the National Botanic Garden, Meise (Belgium) for the suggestion to work on the project of marasmioid fungi from tropical Africa, and for his help. The author's thanks also belong to the curators of the herbaria BR, BRNM, COFC, E, FH, GENT, K(M), NY and PC for the loan of type and non-type herbarium speciens and to A. Verbeken and D. Stubbe (Gent, Belgium), and R. Watling (Edinburgh, Scotland) for kindly submitting their collections, photographs and notes. My thanks are due also to Zdenek Pouzar (Prague, Czech Republic) for valuable nomenclaturical and taxonomic notes to this manuscript. I am also very obliged to the "Fondation pour favoriser les recherches scientifiques en Afrique", which enabled my field trip to Benin in 1997, and also to Mr. André De Groote for logistics and help during my stay there. My collecting excursion to Cameroon in 2001 was supported by the Czech Scientific Foundation (N° 206/01/0093). Laboratory studies in this project and a stay in the National Botanic Garden in Meise, Belgium and the herbarium of the Royal Botanic Gardens, Kew, U.K. were financially supported by the Moravian Museum, Brno, Czech republic (MZM00094862). This monograph represents a continuation of monographic studies in marasmioid genera in tropical Africa. The first part of these studies was a monograph of the genera Marasmius, Gloiocephala, Palaeocaephala and Setulipes (Antonín 2007). Since that time, only one taxonomic paper about marasmioid fungi in tropical Africa (the Marasmius bekolacongoli complex of sect. Globulares) has been published by Douanla-Meli & Langer (2008). In this second monograph, 20 taxa (18 species and 2 varieties) of the genus Crinipellis, and 3 species of Chaetocalathus are included. The region studied included the African continent between the tropics of Capricorn and Cancer except for the island of Madagascar. The aim of this monograph is to summarise the knowledge about tropical African species of two smaller genera, Crinipellis and Chaetocalathus, and to stimulate and support studies of this group of fungi in the future. The results of this monograph are based on studies of the author’s own collections from Benin and Cameroon and of herbarium specimens from the following herbaria: BR, BRNM, E, FH, GENT, K, NY, PC, and material sent by D. Stubbe, A. Verbeken and R. Watling. In total, about 200 specimens were studied. Microscopic features are described from material mounted in Melzer's reagent, Congo Red, H2O and ca. 5 % KOH. For microscopic studies, an Olympus BX50 light microscope was used. If possible, 20 basidiospores were measured in each herbarium specimen. The detailed general survey of used macroscopic and microscopic characters was already published in the monograph of tropical African species of Marasmius, Gloiocephala, Palaeocephala and Setulipes (Antonín 2007), and for details see also Antonín & Noordeloos (2010). In the following paragraphs, only specific characters of the genera Crinipellis and Chaetocalathus and their importance for identification are mentioned. Habitus. The genus Crinipellis is characterized by the marasmioid, less frequently collybioid basidiocarps with central stipe. The main difference of Chaetocalathus is the presence of the pleurotoid basidiocarps with the absent or only rudimentar stipe. Basidiocarps are able to revive after complete dehydration, and to start the production of spores again. Pileus. It is mostly coloured in cream, brown, ochraceous, ferrugineous, purple, purple-pink, or red tinges; old (or revived) specimens may be almost white. Its surface is covered by rather long and distinct, usually coloured setoid hairs. Lamellae. They are mostly well developed, and attached directly to the stipe apex (without a collarium), or form a false collarium. They are usually white to pale cream-coloured, but in some species also purplish or reddish tinged, and may be intervenose in some species. Stipe. The stipe (if present) is always insititious, tough, and covered by setoid hairs usually similar to pileus ones. Pileipellis. In both genera the pileipellis (hypotrichium; a layer under pileus hairs) is a cutis composed of cylindrical to inflated, thin- to slightly thick-walled, smooth or incrusted hyphae. The incrustation may be for some species typical. The pileipellis is covered by long, dextrinoid hairs (Fig. 1). Very important for identification is their reaction with KOH. 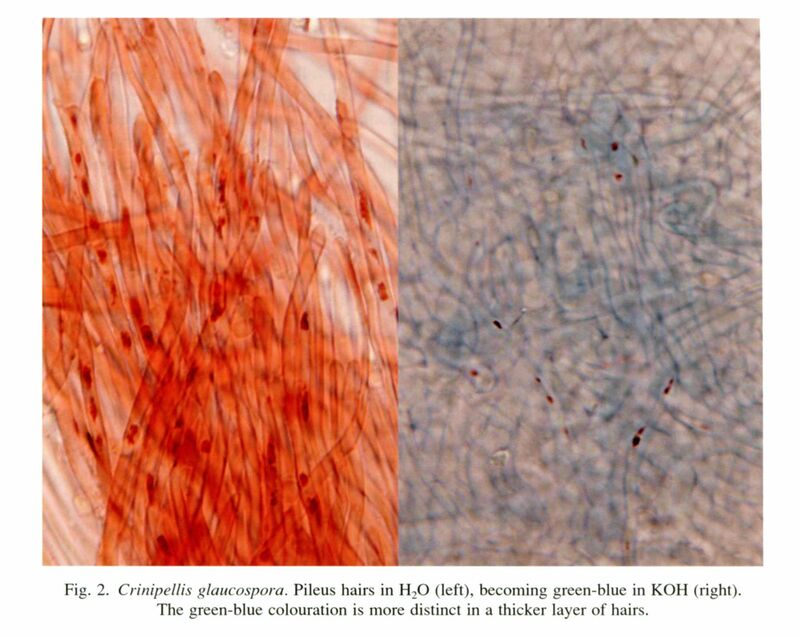 In some species (usually those with the presence of the purple or purple-red colours) the hair walls are coloured brightly blue-green in KOH (Fig. 2) while in other species (mostly yellow-brown, cinnamomeous brown or brown coloured) they remain (yellow-)brown (Fig. 3). Spores. 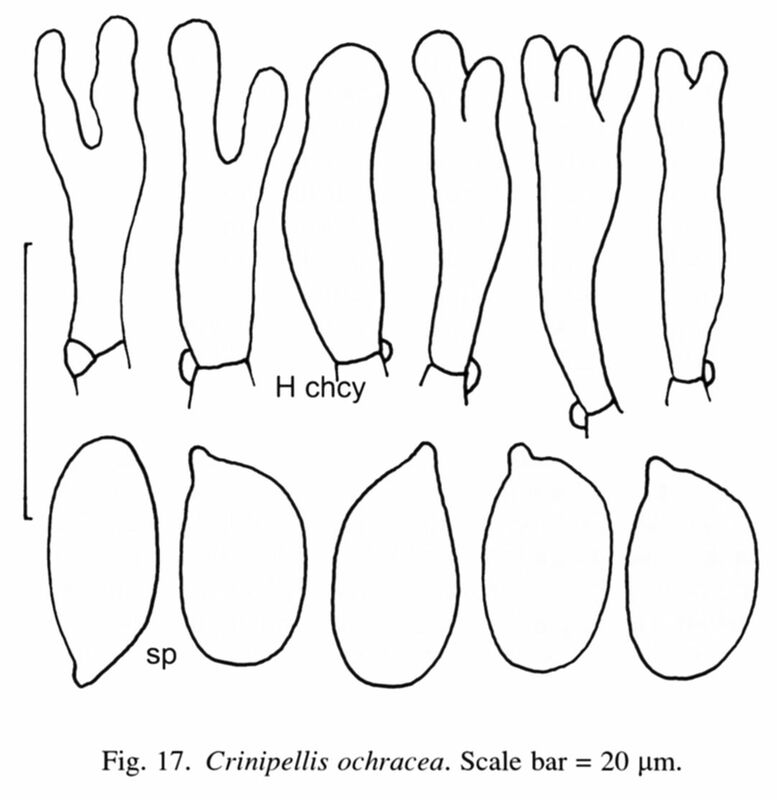 Some species of Chaetocalathus and Crinipellis have dextrinoid spores, or at least part of them dextrinoid. Their size and shape are variable, but they may serve as diagnostic characters at the specific level. The greenish colouration in KOH is described as a typical character of Crinipellis glaucospora Pegler (1966). However, this colour changing seems to be present in more (all?) taxa with the purple or purple-red pigmentation. Basidia. They are generally less important for identificiation, only exceptionally are usable on specific or variety level. However, they are often collapsed, especially in older specimens. Cheilocystidia. They are always present, and their size and shape are often characteristic for the species. 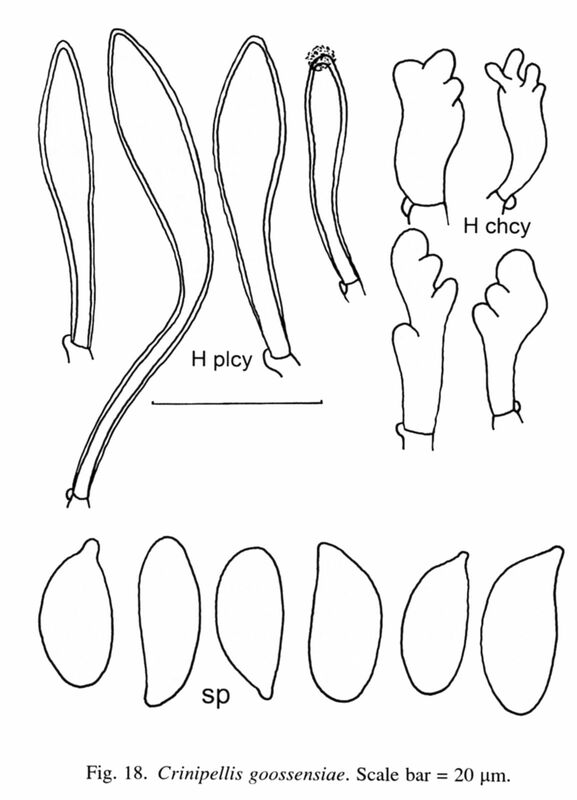 Pleurocystidia. They are rarely developed. Their presence or absence represents an important character for an identification. Hymenial setoid cystidia. They occur exceptionally (e.g. Crinipellis minutuloides). Stipitipellis. For stipitipellis of Crinipellis species, the presence of long, dextrinoid hairs is typical. They are mostly similar to pileus hairs, and are of the lower importance for species identification. The following abbreviations are used: E = quotient of length and width of the spores, Q = mean value of E in all collections studied, L = number of entire lamellae, l = number of lamellulae between each pair of entire lamellae. In the enumeration of revised specimens for each taxon, a question mark is used in case of doubtful identification. In the illustrations sp stands for basidiospores, H chcy for cheilocystidia, H plcy for pleurocystidia, and H se for hymenial setoid cystidia. The basidiospores are drawn with a magnification 2000x, other structures 1000x. The scale alawys represents 20 µm. Authors of fungal names are cited according to the International Plant Names Index Authors website (http:\\www.ipni.org\ipni\authorsearchpage.do), colour abbreviations according to Kornerup & Wanscher (1983), and herbarium abbreviations follow Thiers (2012). A complete history of the marasmioid and collybioid genera was published by Antonín & Noordeloos (2010). The first authors who published collections of Crinipellis and Chaetocalathus from Africa were Hennings (1897, 1901) and Patouillard (1892, 1895). Since this time, species of these genera were published only sporadically (e.g. Morris 1990, Pegler 1966, 1968, 1977). Pegler (1966) described a new species, C. calderi Pegler, from Uganda and revised the type specimen of C. glaucospora (Beeli) Pegler from Sierra Leone. Singer (in Pegler 1968) published two new Crinipellis species (C. ghanaensis Singer and C. palmarum Singer), and one collection of C. dusenii (Henn.) Singer. 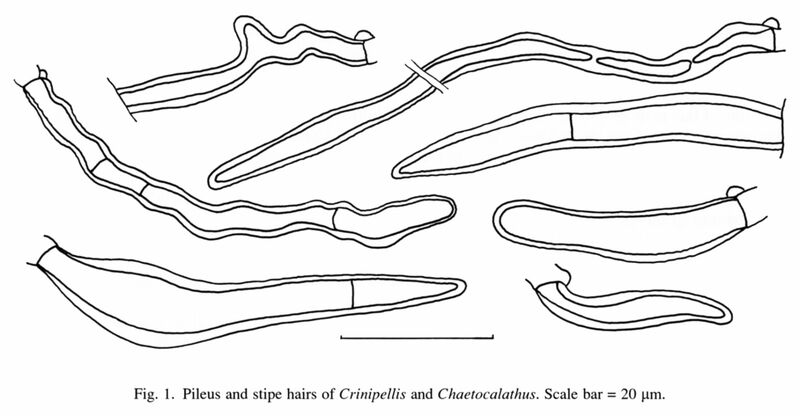 The survey of East African taxa was published by Pegler (1977) with two Chaetocalathus and five Crinipellis species. Chaetocalathus niduliformis (Murrill) Singer from the Democratic Republic of the Congo was published by Singer & Grinling (1967). The first (and till now the last) complete world monograph of both genera was published by Singer (1943). Later, he published a monograph of the Neotropical Crinipellis and Chaetocalathus species (Singer 1976). South American taxa have been also published e.g. by Dennis (1958) and Pegler (1978). The list of species was published by Singer (1986). Molecular studies in some South-American Crinipellis species were published by Aime & Phillips-Mora (2005) and Arruda & al. (2005). 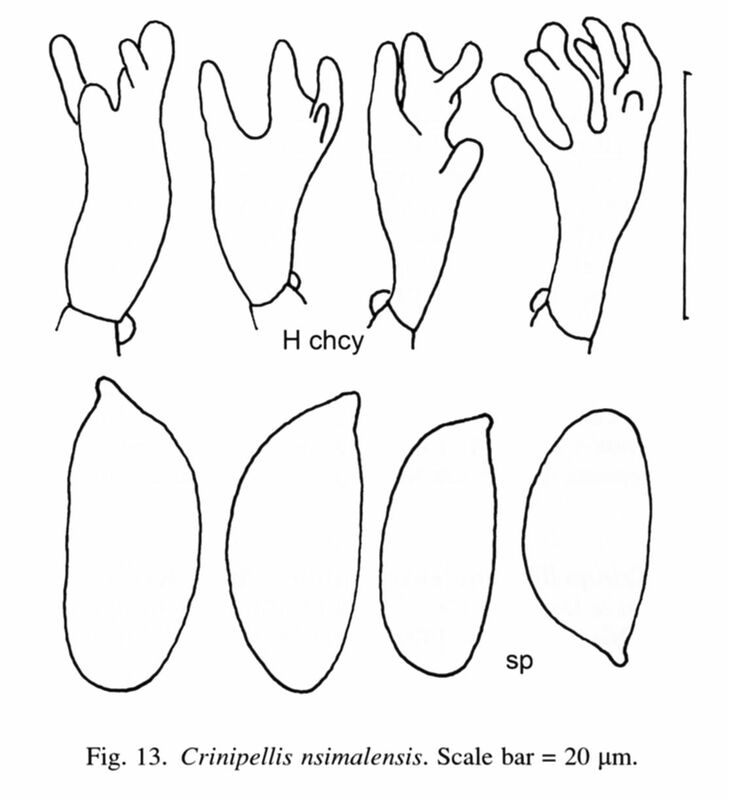 The basic study of Crinipellis in North America was published by Murrill (1915), some other studies e.g. by Doyle (1987), Redhead (1986, 1989), Redhead & Bo (1982), and Shaffer & Weaver (1965). 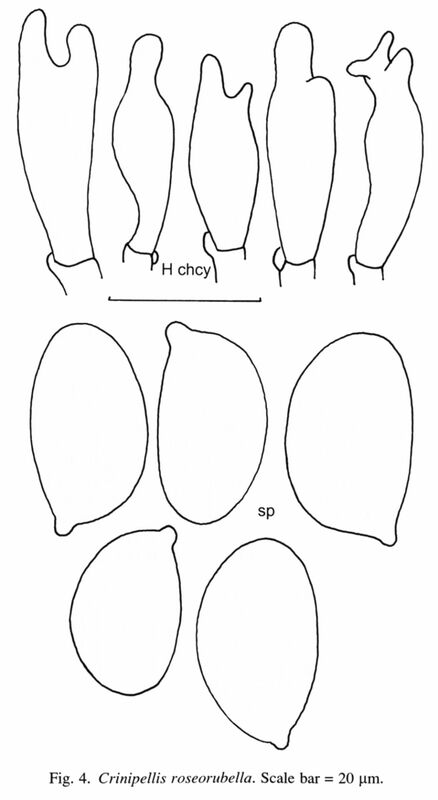 The Asian Crinipellis species were published by Takahashi (2000, 2011) from Japan, Antonín & al. (2009) from the Republic of Korea, Kerekes & Desjardin (2009) from Southeast Asia (for the first time using molecular studies for this genus in this region). Bukhalo (1983) published a new Crinipellis species, C. schevczenkovi Bukhalo, from Kirgizia. The New Zealand taxa were summarized by Stevenson (1964), South-Australian species by Cleland (1934) and Grgurinovic (1997). European monographs of Crinipellis and Chaetocalathus were published by Antonín & Noordeloos (1997, 2010), smaller studies e.g. by Candusso (1986, 1991) and Josserand (1965). Crinipellis Pat., J. Bot. 3: 336 (1889). – Type species: Crinipellis stipitaria (Fr. : Fr.) Pat. Basidiocarps marasmioid or collybioid. Pileus campanulate, convex or conical, then often applanate, covered with long, setiform hairs. Stipe always well-developed, ± cylindrical, insititious, usually covered with similar long hairs like pileus. Basidiospores smooth, thin- or slightly thick-walled. Cheilocystidia mostly present, simple or apically branched or with projections. Pleurocystidia present or absent. Pileipellis and usually also stipitipellis covered with mostly thick-walled hairs. Clamp connections present. Chemical reactions. Hairs on pileus and often also on stipe dextrinoid; basidiospores dextrinoid or non-dextrinoid; trama hyphae non-dextrinoid or weakly dextrinoid; pileus and stipe hairs becoming olivaceous or blue-green in alkalis in some species. Ecology. Saprotrophic, solitary or gregarious on herbaceous and woody plants. Distribution. Worldwide with many species in the tropics. Notes. About 150 taxa are currently described in this genus (according to MycoBank) having mostly a pan-tropical distribution (Singer 1976, 1986). 1. Psilopus Singer – Pileus with a pileipellis of diverticulate, dextrinoid bodies but without actual hairs. Stipe naked. 2. Eu-Crinipellis – Pileus with more or less elongate dextrinoid hairs. Stipe likewise with hairs, never entirely naked in all stages. This section was divided into five subsections: Stipitarinae Singer (with stirps subtomentosa, zonata, stipitaria, stupparia, carecomoeis and setipes), Grisentinae Singer, Iopodinae Singer, Excentricinae Singer and Heteromorphinae Singer. 1. Crinipellis – Pileus merely darker with KOH or not reacting, hairs pale ochraceous brownish to dull ochre or hyaline in KOH, stipe central, usually longer than 7 mm. 2. Excentricinae (Singer) Singer – Pileus merely darker with KOH or not reacting, hairs pale ochraceous brownish to dull ochre or hyaline in KOH, stipe central at first but soon eccentric, 2–7 mm long. 3. Grisentinae (Singer) Singer – Pileus turning green or (green-)black with KOH, and in the latter case the hairs and/or the hypotrichium pale greenish or greenish melleous or greenish grey rather than pale ochraceous brownish to dull ochre or hyaline, and (pleuro)cystidia usually present. 4. Iopodinae (Singer) Singer – Purple, violet lilac, crimson red etc. pileus not changing to green or olive with alkalis and hairs walls not greening in 5 % KOH). 1. Crinipellis – Pileus in some shade of stramineous or brown or without pigmentation, becoming darker or not reacting with KOH, stipe usually longer than 7 mm and central; with subsections Crinipellis and Heteromorphinae Singer. 2. Metuloidophorae Singer – Metuloids developed, pileus not greening or greying with KOH. 3. Excentricinae (Singer) Singer – Stipe at first central but soon becoming eccentric, mostly relatively short and curved. 4. Grisentinae (Singer) Singer – Pileus in some shade of stramineous or brown or bright pink to red, in the former case with pleurocystidia, in the latter case without or with scarce pleurocystidia, turning grey to green with KOH, hairs also becoming green in KOH. 5. Iopodinae (Singer) Singer – Pileus brightly coloured, stipe shorter than three times the diameter of the pileus, basidiospores long fusoid to oblong and not broader than 4.7 µm, or ellipsoid and then not more than 4 µm broad, Q = 2 or larger; with subsections Iopodinae and Insignes Singer. Recently (Aime & Phillips-Mora 2005) proposed to accommodate some fungi of Crinipellis sect. Iopodinae subsect. Insignes in the genus Moniliophthora H.C. Evans, Stalpers, Samson & Benny; species of this genus are parasitic. Moniliophthora perniciosa (Stahel) Aime & Phillips-Mora is a causal agent of witches’ broom and frosty pod rot of Theobroma cacao. Recently described Crinipellis brasiliensis Arruda & al. is parasitic on Heteropterys acutifolia (Arruda & al. 2005). Crinipellis and Moniliophthora (together with Marasmius and Chaetocalathus) form a monophyletic group which may be considered a separate family Marasmiaceae (clade / marasmioid, e.g. Moncalvo & al. 2002; Aime & Phillips-Mora 2005; Wilson & Desjardin 2005). Antonín & Stubbe, Cryptogamie, Mycol. 33(4): in press (2012). – Type: Cameroon, Prov. de l'Est, Dja Biosphere Reserve, Somalomo Distr., Messamena, Schwamm, 12 Apr. 2007, D. Stubbe DS 07372 (BR 164412-94, holotype). Selected descriptions and icons. Antonín, Cryptogamie, Mycol. 33(4): in press (2012). Ecology. Growing on dead twigs. Distribution. So far collected only twice in the very close localities in Cameroon, and in the Democratic Republic of Congo. Cameroon. Prov. de l'Est, Dja Biosphere Reserve, Somalomo Distr., Messamena, Schwamm, trail towards Rochers de Schwamm (with many trees of Uapaca sp. along the trail), 12 Apr. 2007, D. Stubbe DS 07372 (BR 164412-94, holotype). – Ibid., D. Stubbe DS 07346 (GENT?). Democratic Republic of Congo. Eala, 15 June 1923, M. Goossens-Fontana 40 (BR 031795-76). Notes. Crinipellis roseorubella is characterized in having a small, dark pinkish red pileus with paler margin, distant, anastomosing, white lamellae, a short and rather thick, pale pinkish red stipe, very large basidiospores, large basidia, pileus hairs with mostly greenish blue to blue walls in KOH, and absence of pleurocystidia. Crinipellis roseorubella belongs to the species group with largest basidiospores in the genus in the world. Crinipellis macrosphaerigera Singer, described from Brazil, has 12.3–13.8 × 9.5–11.7 μm large, globose to subglobose basidiospores, and a centrally black pileus (Singer 1976); C. carecomoeis (Berk. & M.A. Curtis) Singer, from Central America, has long, but narrow ((9–)13–14.5(–20) × (3.5–)4–5(–6.3) μm) basidiospores, a cinnamon buff or tawny olive pileus, and a chestnut brown to ferrugineous stipe (Singer 1976); C. carecomoeis var. litseae Singer, known from the Philippines, has 12.8–16.5 × 4.5–5.8 μm large basidiospores, a very small, only 3–4 mm broad, cinnamon buff to tawny pileus, and a longer and thinner, 7–21 × 0.2–0.5 mm large stipe (Kerekes & Desjardin 2009); C. insignis Singer, from Bolivia, has especially narrower basidiospores (10.5–13.5 × 4.5–6.5 μm), and C. eggersii Pat., from the north of South America, has smaller, (7–)11–13(–14) × (4–)5.5–6.3(–7.5) μm basidiospores as well (Singer 1976); C. brunneipurpurea Corner, known from Indonesia and Malaysia, has a violet-brown to dark ruby pileus, a larger stipe (6–33 × 1–2 mm), and narrower basidiospores (10–14 × 3–5 μm) (Kerekes & Desjardin 2009). Singer in Pegler, Kew Bull. 21: 521 (1968). – Type: Nigeria, Ibadan, University College Site, Palm Forest, 25 Apr. 1958, C.N. Williams 33 (K(M) 125814, holotype). Selected descriptions and icons. Pegler, Kew Bull. 21: 521–523 (1968); Pegler, Kew Bull. Addit. Ser. 6: 209 (1977). Pileus up to 10 mm broad, convex, becoming subumbonate, thin, radially striate to sulcate, margin straight, undulate, entire, “amethyst violet”, drying sepia, covered with small, recurved tufts of hairs. Lamellae more or less free, moderately crowded, rather narrow, pale amethyst coloured. Stipe 15–16 × 1 mm when dry, insititious, cylindrical, off-white at the apex becoming brownish towards the base, covered with minute hairs. Context thin, white. (According to Singer in Pegler 1968). Ecology. On fallen palm debris. Distribution. So far known only from the type locality in Nigeria. Nigeria. Ibadan, University College Site, Palm Forest, 25 Apr. 1958, C.N. Williams 33 (K(M) 125814, holotype). Notes. Crinipellis palmarum is characterized by having a small, amethyst violaceous pileus, rather small and narrow, only non-dextrinoid basidiospores, rather short pileus and stipe hairs, by the absence of pleurocystidia, and growing on palm debris. 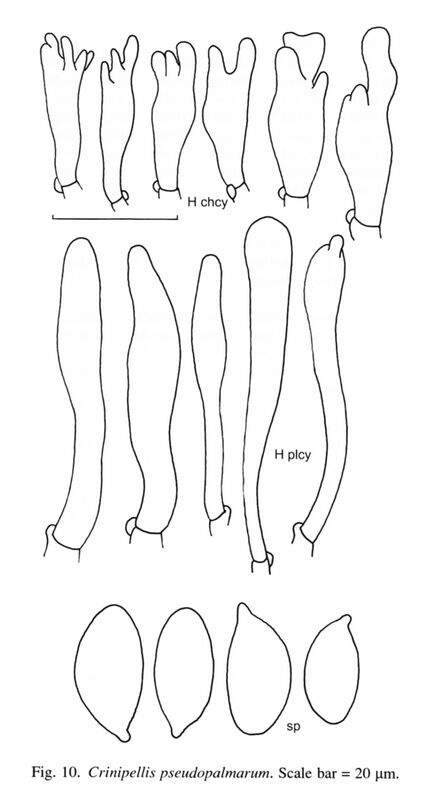 Singer (in Pegler 1968) mentioned a different length of cheilocystidia (13.5–30 × 3.0–5.5 µm) in the original description. 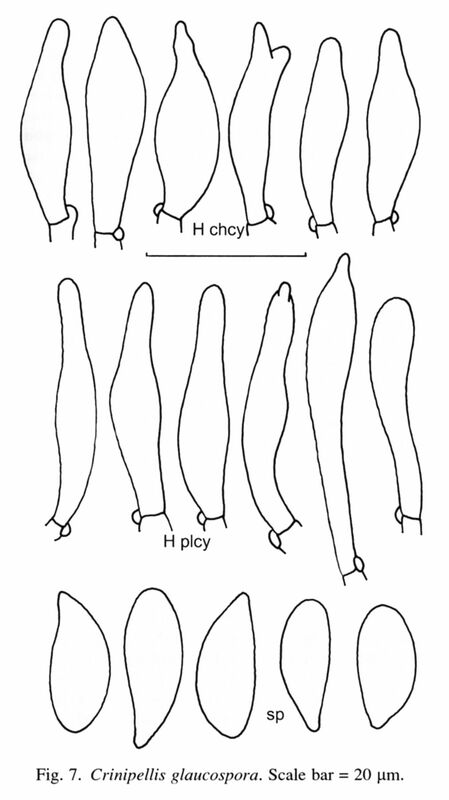 In comparison with other species without pleurocystidia, Crinipellis atrovinosa Pegler differs by an up to 45 mm long stipe, larger basidiospores (8.0–14 × 3.2–5.5 μm), and differently shaped cheilocystidia; C. purpurea Singer, described from Colombia, has a darker, at centre purple or black-purple pileus, different cheilocystidia and a different microchemical reaction of pileus and stipe hairs with KOH (Singer 1976); C. insignis Singer, from Bolivia, has larger basidiospores (10.5–13.5 × 4.5–6.5 μm), and larger (16–51 × 3.7–5 μm), simple cheilocystidia (Singer 1976); C. sublivida Murrill, from Mexico, by an up to 20 mm broad pileus, pale lilac lamellae, shorter basidiospores and a different pileus pigmentation (Murrill 1915, Singer 1943, Singer in Pegler 1968); C. eggersii Pat., known from Ecuador, has (8–)10–13 × (5–)5.5–6.3 μm large basidiospores and 31–45 µm long basidia; C. iopus Singer, from Kazakhstan, 9–11(–12) × 4–5.5(–5.7) µm large basidiospores, and very long basidia (50–53 × 8–8.5 µm) (Singer 1943, 1976). Crinipellis corvina Har. Takah., described from Japan, has a blackish purple pileus and stipe hairs, smaller basidiospores (6.5–8 × 3.5–4.5 µm), and often thick-walled, differently shaped cheilocystidia (Takahashi 2000). Crinipellis brunneipurpurea Corner, known from Indonesia and Malaysia, has larger basidiospores (10–14 × 3–5 μm) and cheilocystidia only with occasional knobs or projections, C. aff. mirabilis Singer, collected in Malaysia, New Caledonia and Thailand, has larger basidiospores (8–12 × 3–5 μm) and differently shaped cheilocystidia, and C. tabtim Kerekes & al., described from Thailand, has a longer, 15–30 mm long stipe, and larger basidiospores (8–11 × 4–5.5 μm); C. dipterocarpi f. cinnamomea Kerekes & al., known from Indonesia, Malaysia and Thailand, has a longer stipe (15–45 mm), larger basidiospores (6–11 × 3–5 μm), and pileus and stipe hairs not changing colour to green in KOH (Kerekes & Desjardin 2009). Crinipellis pedemontana Vizzini & al., described from Italy, differs by having more robust basidiocarps (pileus (5–)10–18(–24) mm broad, stipe 15–32(–40) × (1.5–)2–3.5(–4) mm), wider basidiospores (7.5–9.0(–10) × (4.0–)4.5–6.0(–6.5) μm), and the presence of chlamydospores in a suprapellis (Antonín & Noordeloos 2010, Vizzini & al. 2007). Moniliophthora perniciosa (Stahel) Aime & Phillips-Mora has a larger, 5–25 mm broad pileus, a yellow stipe at base when young, 9–12.5 × 4.5–6 µm large basidiospores, and grows parasitically on Theobroma cacao trees (Aime & Phillips-Mora 2005, Pegler 1978); Crinipellis siparunae Singer grows parasitically especially on living twigs of Siparuna, and has wide basidiospores (10–14 × 5.5–8 µm) and longer, 33–40 µm basidia (Singer 1943). Pegler, Kew Bull. Addit. Ser. 6: 209 (1977). Selected descriptions and icons. Pegler, Kew Bull. Addit. Ser. 6: 209–210 (1977). – Type: Kenya, Nyanza Prov., Kericho Distr., Mau Forest, African Highlands Tea Est., 26 March 1968, D.N. Pegler 266 (K(M) 147481, holotype). Ecology. On dead twigs and leaves. Distribution. So far known only from the type locality in Kenya. Kenya. Nyanza Prov., Kericho Distr., Kiptiget River, Mau Forest, African Highlands Tea Est., 26 March 1968, D.N. Pegler K266 (K(M) 147481, holotype). Notes. Crinipellis atrovinosa is characterized by a rather small, vinaceous brown pileus, a dark brown stipe, moderately large basidiospores, well-developed simple cheilocystidia, the absence of pleurocystidia, and pileus and stipe hairs becoming green-blue (turquoise) in KOH. 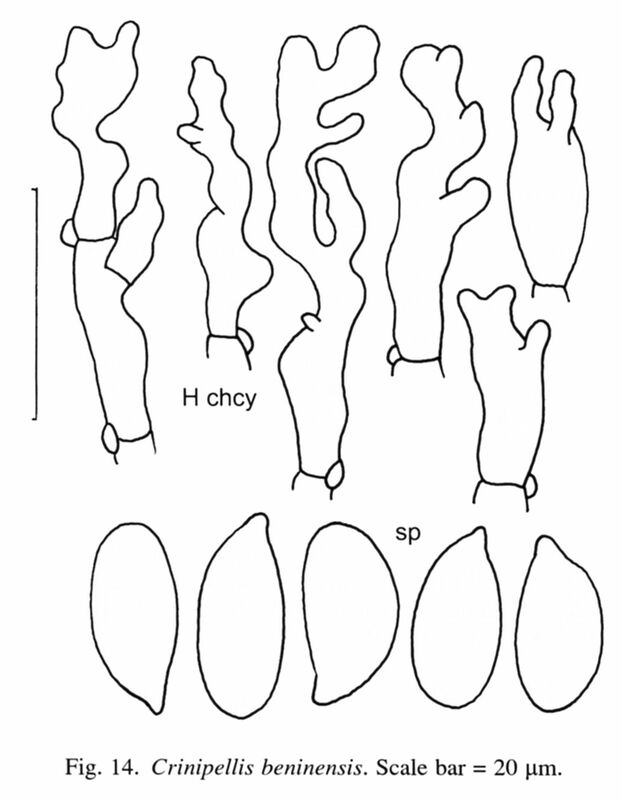 However, the type specimen has distinctly larger basidiospores, larger basidioles and more robust cheilocystidia than mentioned in the original description (8–11.5 × 3.5–4.5 μm) (Pegler 1977). Crinipellis palmarum Singer differs by having a shorter, up to 16 mm long stipe, smaller basidiospores (7.5–9.5 × 3.5–4.2 μm), and differently shaped cheilocystidia; C. corvina Har. Takah., from Japan, has even darker, blackish purple pileus and stipe hairs, smaller basidiospores (6.5–8 × 3.5–4.5 µm), and often thick-walled, differently shaped cheilocystidia (Takahashi 2000); C. rubida Pat. & Heim, from Venezuela, has smaller basidiospores (5 × 2 µm); C. eggersii Pat., from Ecuador, (8–)10–13 × (5–)5.5–6.3 μm large basidiospores and 31–45 µm long basidia; the Mexican C. sublivida Murrill has an up to 20 mm broad pileus, pale lilac lamellae, 8.7–11(–14) × 3.5–4 μm large basidiospores, and cheilocystidia with apical projections; C. iopus Singer, from Kazakhstan, 9–11(–12) × 4–5.5(–5.7) µm large basidiospores, and very long basidia (50–53 × 8–8.5 µm) (Singer 1943, 1976); C. purpurea Singer, described from Colombia, has a darker, at centre purple or black-purple pileus, different cheilocystidia and a different microchemical reaction of pileus and stipe hairs with KOH (Singer 1976); C. insignis Singer, from Bolivia, has wider basidiospores (10.5–13.5 × 4.5–6.5 μm), and larger (16–51 × 3.7–5 μm) cheilocystidida (Singer 1976). Crinipellis brunneipurpurea Corner, known from Indonesia and Malaysia, has a violet brown to dark ruby coloured stipe, and cheilocystidia with occasional knobs or projections; C. aff. mirabilis Singer, collected in Malaysia, New Caledonia and Thailand, has a shorter (8–22 mm), dark reddish brown to violet brown stipe; C. tabtim Kerekes & al., described from Thailand, has a shorter, 15–30 mm long stipe, and smaller basidiospores (8–11 × 4–5.5 μm), and C. dipterocarpi f. cinnamomea Kerekes & al., known from Indonesia, Malaysia and Thailand, has smaller basidiospores (6–11 × 3–5 μm), and pileus and stipe hairs not changing colour to green in KOH (Kerekes & Desjardin 2009). Crinipellis pedemontana Vizzini & al., described from Italy, differs by having more robust basidiocarps (pileus (5–)10–18(–24) mm broad, stipe 15–32(–40) × (1.5–)2–3.5(–4) mm), shorter and slightly wider basidiospores (7.5–9.0(–10) × (4.0–)4.5–6.0(–6.5) μm), different cheilocystidia, and the presence of chlamydospores in a suprapellis (Antonín & Noordeloos 2010, Vizzini & al. 2007). Moniliophthora perniciosa (Stahel) Aime & Phillips-Mora has a short, only 5–14 µm long stipe, at base yellow when young, 9–12.5 × 4.5–6 µm large basidiospores, and grows parasitically on Theobroma cacao trees (Pegler 1978); Crinipellis siparunae Singer grows especially on living twigs of Siparuna, and has wide basidiospores (10–14 × 5.5–8 µm) and longer, 33–40 µm long basidia (Singer 1943). The other, similarly coloured specimens studied and originally identified as C. atrovinosa agree well with the original Pegler’s description, and are described as a new var. parvispora here. Antonín & Rammeloo, Cryptogamie, Mycol. 33(4): in press (2012). – Type: Democratic Republic of Congo, Irangi, Kivu, Apr. 1972, J. Rammeloo JR Z343 (GENT). Ecology. On twigs and leaf litter, on bark of fallen Ficus sycamora, and at base of a nere-tree (Parkia biglobosa). Distribution. This variety is known from Democratic Republic of Congo, Ethiopia, Ghana and Nigeria. Democratic Republic of Congo. Irangi, Kivu, Apr. 1972, J. Rammeloo JR Z343 (GENT, holotype). – ? 20km of NE of Yambao, 19 June 1939, J. Louis 15245 (BR 031800-81). Ethiopia. Illubabare Prov., Gambela, alt. 1087 m, 28 July 1971, Ash 1087 (K(M) 157447). Ghana. ? Cape Coast, near Efutu, 19 May 1975, A.C. Rose C.C.7551B (K(M) 157454). Nigeria. Cross River State, Uyo, Anua Ravine, 6 June 1990, R.A. Nicholson 498 (K(M) 16549). – Ibid., 14 Apr. 1990, R.A. Nicholson 346 (K(M) 16751). – Cross River State, Calabar to Cameroon road, 3 July 1990, R.A. Nicholson 599 (K(M) 18618). Notes. It differs from var. atrovinosa by having distinctly smaller basidiospores, smaller basidia and basidioles. Cheilocystidia are, however, very variable: between 15–25 × 6.0–7.0 μm (K(M) 16549), and 30–45 × 4.5–9.0 μm (Antonín B97.112). Collections J. Louis 15245 (BR 031800-81) and A.C. Rose C.C.7551B (K(M) 157454) are included with a question mark here because of the slightly smaller basidiospores. Pegler, Persoonia 4: 107 (1966). – Naucoria glaucospora Beeli, Bull. Jard. Bot. État Brux. 15: 39 (1938). – Type: Sierra Leone, Njala, 2 July 1935, F.C. Deighton M747 (K(M) 147478, holotype). Selected descriptions and icons. Pegler, Persoonia 4: 107–108 (1966). Ecology. On dead stump, in hollow trunk of living Cynometra leoninsis, and on dead parts of root-bark of Azadirachta indica, and in a Cola laurifolia stand. Distribution. So far known from Benin, Ghana, Niger, Republic of Côte d'Ivoire, Senegal, Sierra Leone and Tanzania. Benin. Atacora Prov., Kota, Chutes de Kota, 10º12.680’ N, 01º26.723’ E, 27 Aug. 1997, V. Antonín B97.112 (BR 101157-83). – Wari Maro, 29 Sept. 1998, A. De Kesel 2351 (BR 112844-33). – Ibid., 7 Aug. 1999, S. Norou Yorou 99 (BR 130098-21). Ghana. Cape Coast, Accra, Castle road, 10 June 1975, A.C. Rose C.C.7551 (K(M) 157452). – Cape Coast, Bruku river, 23 June 1975, A.C. Rose C.C.7551A (K(M) 157455). – ? Tafo, 5 Aug. 1955, M. Holden GC97 (K(M) 157450, as C. dusenii). Niger. Tillabery, Say, W National Park, Tamou, 12º 14' 54'' N, 02º 22' 20'' E, alt. 221 m, 25 Aug. 2011, leg. O. Hama, M. Barage & D. Ibrahim (O. Hama 477, COFC 5098). – Ibid., Mekrou, 12º 15' 18'' N, 02º 23' 22'' E, alt. 332 m, 6 Aug. 2010, O. Hama, P.P. Daniëls, D. Ibrahim & M. Rosas (O. Hama 314, COFC 5097). Republic of Côte d'Ivoire. Sakré, 15 Aug. 1975, L. Aké Assi 377 (K(M) 157453, ex herb. Univ. Abidjan). Senegal. Thiara, 25 Aug. 1986, D. Thoen 7667 (BR 060729-07). Sierra Leone. Njala, 2 July 1935, J.C. Deighton M747 (K(M) 147478 ex herb. IMI 28785, part of the holotype). Tanzania. Eastern Prov., Kilosa Distr., Ilonga, Matarawe River, alt. 503 m, 26 Apr. 1968, D.N. Pegler T1092 (K(M) 125815, as C. palmarum). Notes. Crinipellis glaucospora is characterized by having a pink pileus with a reddish brown centre, covered with reddish brown hairs, moderately large basidiospores, the presence of mostly simple cheilo- and pleurocystidia, and pileus and stipe hairs becoming green-blue (turquoise) in KOH. 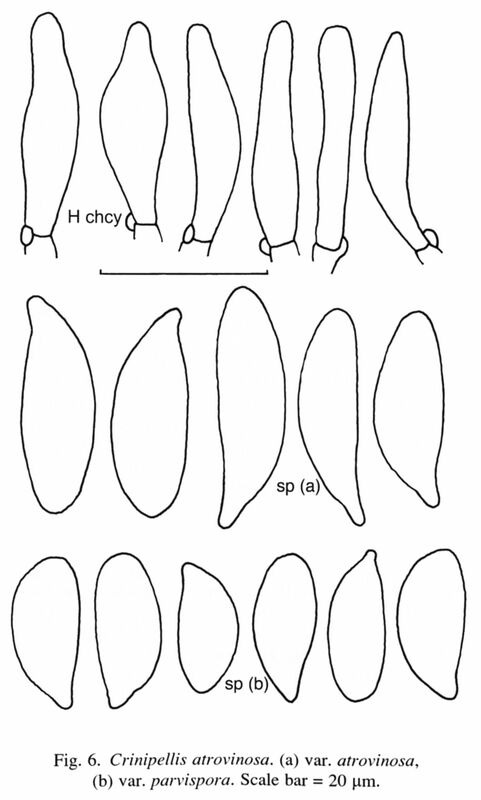 Pegler (1966) mentioned smaller basidiospores (6–8.5 × 3.2–4 μm) and distinctly smaller pleurocystidia (21–24 × 4–5.5 μm), however, both structures were larger also in the type specimen. The same author also mentioned a greenish colouration of basidiospores in KOH as a typical character of this species. However, it seems that this colour is present in more (all?) taxa with the purple or purple-red pigmentation. Collection A.C. Rose C.C.7551B (Ghana, Efutu) is included with a question mark here. It differs by very small basidiocarps (herbarium specimen), up to 40 μm long cheilocystidia, and longer (35–53 × 6.5–9.5 μm), mostly clavate pleurocystidia. Unfortunately, the macroscopic description is not available. Among species having a purple pileus tinge and possessing pleurocystidia, Crinipellis alcalivirens Singer, described from Colombia, has a ferrugineous to chestnut brown pileus, shorter and broader basidiospores (7.5–8.5 × 4.5–5.7 μm), mostly apically forked cheilocystidia, and a different microchemical reaction with KOH (Singer 1976). Crinipellis dusenii has larger basidiospores (10–12.5 × 4.0–5.0 μm), mostly apically branched cheilocystidia and larger pleurocystidida (31–57 × 8.5–11(–13) µm). Collections from Wari Maro, Benin (A. De Kesel 2351 and S. Norou Yorou 99) agree well with C. glaucospora but cheilocystidia are often slightly thick-walled at apex. Unfortunately, their macroscopic descriptions are not available. Patouillard, Bull. Mus. Hist. Natur. 30: 526 (1924). – Type: Madagascar, Maromandia, Andranomaloza, January, M. Decary s.n. (PC, holotype, not revised). Selected descriptions and icons. Patouillard, Bull. Mus. Hist. Natur. 30: 526–527 (1924); Singer, Lilloa 8: 499 (1943). Ecology. On humus and plant debris under wet wood, and on fallen twigs in a dry forest. Distribution. So far known from the Democratic Republic of the Congo, Ghana and Madagascar (Patouillard 1924). Democratic Republic of Congo. Kisangani, Congolo Island, 14 Apr. 1984, B. Buyck 1440 (BR 000101-04). – Binga, 4 June 1928, M. Goossens-Fontana 764, det. R. Singer (BR 031792-73). Notes. Crinipellis rubiginosa is characterized by having a small pileus with a long stipe, moderately large basidiospores, the presence of mostly simple cheilo- and rather long pleurocystidia, and pileus and stipe hairs becoming green-blue (turquoise) in KOH. Crinipellis rubiginosa differs from the very close C. glaucospora by very small basidiocarps with a long stipe, larger basidiospores, up to 40 μm long cheilocystidia, and longer, mostly clavate or (sub)cylindrical pleurocystidia. Singer in Pegler, Kew Bull. 21: 518 (1968). – Marasmius dusenii Henn., Engl., Bot. Jahrsb. 22: 100 (1897). – Types: Cameroon, N’dian, 3 Juni 1892, P. Dusén 35 and Yaounde, in a virgin forest, 15 March 1894, Zenker & Staudt 274 (syntypes, probably not preserved). – Ghana, Tafo, 8 Apr. 1955, M. Holden GC 35 (neotype, K(M) 147480). Selected descriptions and icons. Pegler, Kew Bull. 21: 518–520 (1968); Singer, Fl. Neotrop. 17: 41–42 (1976). Ecology. On leaf litter under Theobroma cacao, and on dead twigs and leaves on forest floor. Distribution. So far known from Cameroon, Democratic Republic of Congo, Ghana and Nigeria, may be from Senegal and Tanzania. Cameroon. Dja Biosphere Reserve, near Somalomo, 03° 21’ 34’’ N, 12° 44’ 19’’ E, alt. 640 m, 7 Apr. 2001, V. Antonín Cm 01.57 (BRNM). – Ibid., near Somalomo, 03°23.65’ N, 12°43.37’ E, alt. 650 m, 6 Apr. 2007, A. Verbeken 07-15 (BR 164520-08). – South West Prov., Korup National Park, Mundemba, transect P – base camp, alt. 100–150 m, 7 Apr. 1990, R. Watling s.n. (E). Democratic Republic of Congo. Prov. Orientale, Yangambi, 00°46’' N, 24°18’ E, alt. c. 470 m, 18 May 1939, J. Louis 14862, det. R. Singer (BR 031786-67). – ? Binga, 16 May 1927, M. Goossens-Fontana 605 (BR 031788-69). Ghana. Tafo, 8 Apr. 1955, M. Holden GC35 (neotype, K(M) 147480). Nigeria. Ibadan, Ife Biological Gardens, May 1967, M.H. Zoberi 81 (K(M) 157451). – Cross River State, close Oban, 3 Aug. 1990, R. Nicholson 685 (K(M) 23101). – Ibid., Calabar–Cameroon road, Oban Forest, 18 Aug. 1990, R. Nicholson 724 (K(M) 23067). Senegal. ? Forêt des Bayotes, 22 Aug. 1986, D. Thoen 7611 (BR 060725-03). Tanzania. ? Tanga Prov., Lushoto Distr., Lushoto, W. Usambara Mts., Magamba Forest Reserve, 23 Apr. 1968, D.N. Pegler T659 (K(M) 157456, as C. cf. mirabilis). Notes. Crinipellis dusenii is characterized by having a deep brown vinaceous to russet vinaceous pileus, white lamellae, rather large basidiospores, cheilocystidia simple or often with apical projections, and by the presence of pleurocystidia. In his descriptions, Singer (1943) and Singer (in Pegler 1968) stated that the type specimens are missing, probably lost. The author was also not able to trace them. Thefore, the collection used by Singer (in Pegler 1968) for the description in his paper (Ghana, Tafo, 8 Apr. 1955, M. Holden GC35, K(M) 147480) was selected as a neotype collection. Singer (in Pegler 1968) mentioned smaller basidiospores (6.5–9.5 × 4–4.8 µm), and only 24–40 µm long pleurocystidia. Collection Pegler T659 is microscopically similar but has even larger basidiospores (10.5–13 × 4.5–5.7 µm, average 12.4 × 4.9 µm, E = 2.10–2.88, Q = 2.51). 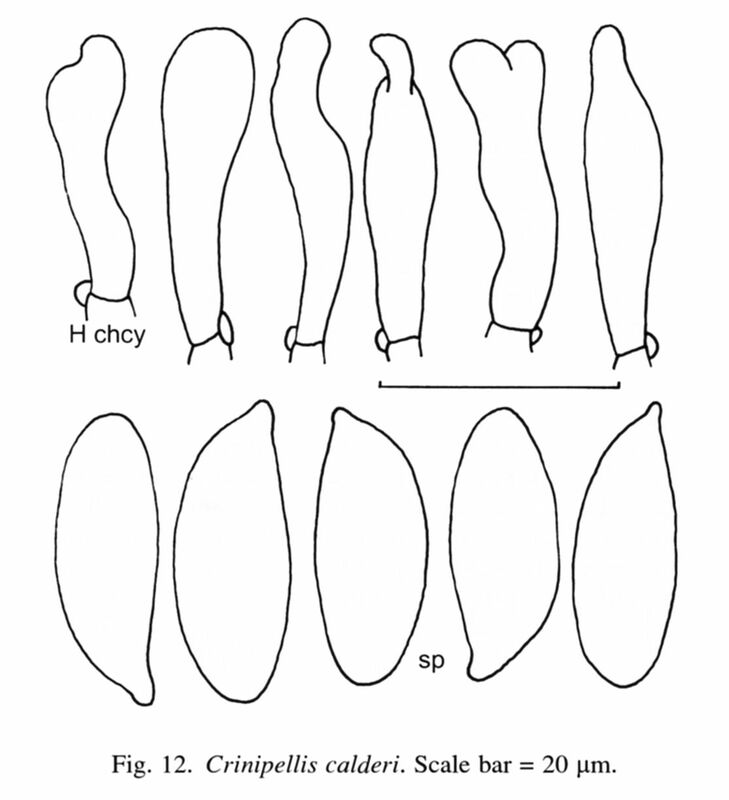 Collection J. Louis 14.862 differs by having only simple cheilocystidia and larger (10–13.5 × 4.5–5.5 µm) basidiospores; they may be on the margin of the variability of this species. The collection Goossens-Fontana 605 is included with a question mark here because it has predominantly simple and broader cheilocystidia (33–50 × 12–15 µm); other characters agree with C. dusenii. Crinipellis pseudopalmarum Antonín & al. differs especially by broader basidiospores and longer and more slender pleurocystidia. Crinipellis alcalivirens Singer, from Colombia, has a ferrugineous to chestnut brown pileus, smaller basidiospores (7.5–8.5 × 4.5–5.7 μm) and a different microchemical reaction with KOH (Singer 1976). Antonín, P. Roberts & Watling, in Antonín, Cryptogamie, Mycol. 33(4): in press (2012). – Type: Cameroon, South West Prov., Korup National Park, Mundemba, PV/S line, 13 Apr. 1990, R. Watling s.n. (E, holotype). Pileus up to 18 mm broad (dry specimens), campanulate, then convex, with depressed centre and with or without central papilla, margin involute, fibrillose, dark purple, purple-brown, blood red or carmine. Lamellae distant, L = 15–18, l = 1–2, white, then cream or concolorous with the pileus, with concolorous edge. Stipe up to 25 × 2 mm, cylindrical, fibrillose, coloured as the pileus; basal mycelium whitish pink to blood red. (According to the descriptions by collector and dry specimens). Ecology. Binding an aerial litter, on dead, attached or fallen twigs, on wood, and on liana twigs. Distribution. To date known only from the Korup National Park in Cameroon, where it seems to be very common. Cameroon. South West Prov., Korup National Park, Ireba-Inene camp, alt. 50 m, 14 Apr. 1997, M.E. Bechem & P.J. Roberts s.n., det. P.J. Roberts (K(M) 60223, as C. palmarum). – Ibid., transect P, 25 Apr. 1996, P.J. Roberts K79 (K(M) 57919, as C. palmarum). – Ibid., transect P, 26 Apr. 1996, P.J. Roberts K136 (K(M) 39180, as C. cf. palmarum). – Ibid., trail to Rengo Rock camp, 3 May 1996, P.J. Roberts K411 (K(M) 57920, as C. palmarum). – Ibid., Mundemba, PV/S line, 13 Apr. 1990, R. Watling s.n. (E, holotype). – Ibid., transect P–P10, 16 Apr. 1990, R. Watling s.n. (E). – Ibid., 11 Apr. 1990, R. Watling s.n. (E). – Ibid., transect P18–P22, 24 March 1991, R. Watling s.n. (E). – Ibid., transect P–base camp, 7 Apr. 1990, R. Watling s.n. (E). Notes. Crinipellis pseudopalmarum is characterized by a dark blood red/carmine pileus, white to red lamellae, its stipe concolorous with pileus, broad basidiospores, and long (sub)cylindrical, narrowly fusoid, obtuse or rostrate pleurocystidia. According to the herbarium specimens, this fungus seems to be macroscopically similar to C. palmarum, however, it differs distinctly by the larger basidiospores, and the presence of pleurocystidia. Among other species with a purple pileus tinge and well-developed pleurocystidia, Crinipellis alcalivirens Singer, from Colombia, has a ferrugineous to chestnut brown pileus, smaller basidiospores (7.5–8.5 × 4.5–5.7 μm), and a different microchemical reaction with KOH (Singer 1976). Crinipellis dusenii (Henn.) Singer has more or less crowded (L = c. 35), white or pale cream lamellae, a longer and thinner (20–60 × 0.5–1 mm), wood brown or grey-brown stipe, and narrower basidiospores (10–12.5 × 4.0–5.0 μm, average 11.0 × 4.8 μm) with a different Q-ratio (Q = 2.29). Antonín, Cryptogamie, Mycol. 33(4): in press (2012). – Type: Gabon, Ogooué-Ivindo, Station d'Ipassa-Makokou, 13 March 2005, S. Dibaluka Mpulusu 13 (BR 159812-53). Pileus up to 10 mm broad when dried, convex to plano-convex, with small papilla at centre, involute at margin, slightly concentrically zonate, fibrillose, ochraceous brown, fibrils dark brown at centre and ± concolorous with pileus towards margin. Lamellae moderately distant, L = c. 18–20, l = 1–2, yellowish brown or alutaceous when dry, edge finely pubescent, concolorous. Stipe up to 10 × 0.5 mm, central, cylindrical, insititious, hairy-tomentose, with ± strigose base, brown. (According to dry basidiocarps of the holotype). Ecology. On fallen branches and litter. Distribution. So far collected in Gabon and Tanzania. Gabon. Ogooué-Ivindo, Station d'Ipassa-Makokou, 13 March 2005, S. Dibaluka Mpulusu 13 (BR 159812-53, holotype). Tanzania. Tanga Prov., Lushoto Distr., Usambara Mts, Magamba, c. 4 km N of Lushoto, 4º 50’ S, 38º15’ E, alt. 1600–2000 m, 21–22 Febr. 1973, L. Ryvarden 10887, det. D.N. Pegler (K(M) 138494, as C. cf. minutula). Notes. 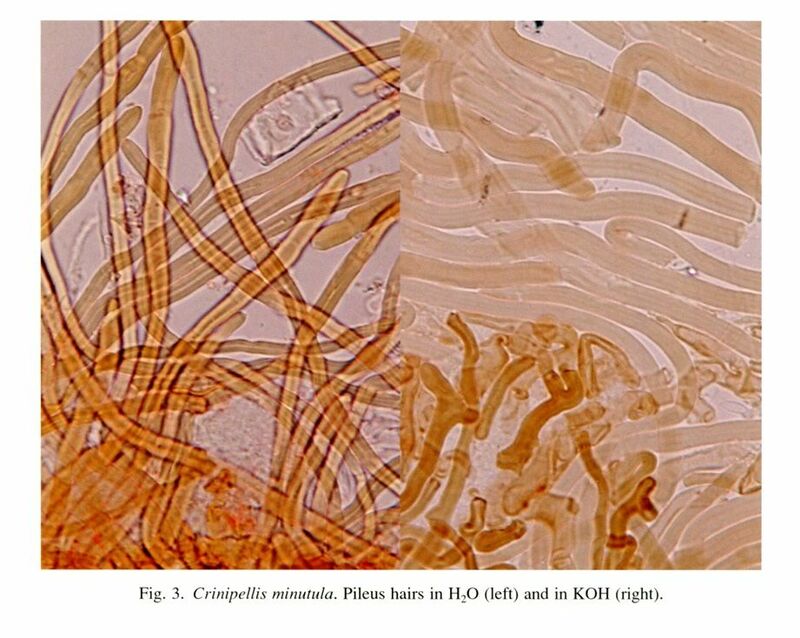 Crinipellis minutuloides is characterized by a small pileus and stipe, rather small basidiospores, apically branched cheilocystidia, the presence of hymenial setae, and pileus and stipe hairs with olivaceous-brown walls in KOH. Crinipellis minutula (Henn.) Pat. differs by having a shorter stipe (4–5 × 0.5–0.8 mm), fusoid, subutriform, less frequently clavate, often (sub)rostrate, simple, smooth cheilocystidia, clavate, subcylindrical or fusoid, thin- to slightly thick-walled pleurocystidia, and by the absence of hymenial setae (holotype FH!). This species has a special position in the genus Crinipellis by having hymenial setoid cystidia representing a unique character in the genus. Pegler, Persoonia 4: 106 (1966). – Type: Uganda, Mpanga 69, Makerere University College, 15 Apr. 1964, E.A. Calder 52 (K(M) 147486, holotype). Selected descriptions and icons. Pegler, Persoonia 4: 106–107 (1966); Pegler, Kew Bull. Addit. Ser. 6: 210–211 (1977). Ecology. On rotten fallen branch of Theobroma cacao, and on fallen twigs, both in a primary rain forest with Gilbertodendron and Scaphopetalum and in artificial stands. Distribution. So far it has been collected in Burundi, Democratic Republic of Congo, Ghana and Uganda. Burundi. Bururi Prov., Kigwena, Kigwena Forest, 22 Febr. 1979, J. Rammeloo 6716 (BR 011947-16). Democratic Republic of Congo. Tshopo Prov., Kisangani, near Batiabongena, 5 May 1984, B. Buyck 1680 (BR 011726-86). – Ibid., 8 Apr. 1984, B. Buyck 1349 (BR 011771-34). Ghana. Cape Coast, near Efutu, cocoa farm, 16 Dec. 1974, C.A. Rose CC7456 (K(M) 157449). Uganda. Mpanga 69, Makerere University College, 15 Apr. 1964, E.A. Calder 52, det. D.N. Pegler (K(M) 147486, holotype). – Oruna, 21 miles on Fort Postal–Kampala road, 21 July 1981, M.A. Chandhry 20/81 (K(M) 157448). – Buganda Prov., Mengo Distr., Mawakota Co., Mpanga Research Forest, 8 Apr. 1968, D.N. Pegler U1320 (K(M) 147489). – Ibid., 7 June 1968, D.N. Pegler U1245 (K(M) 147488). Notes. Crinipellis calderi is characterized by having a black-brown pileus centre and stipe base, distant lamellae, large basidiospores, poorly developed cheilocystidia, a well- developed and conspicuous hypotrichium, rather short pileus- and stipe-hairs, and by the absence of pleurocystidia. Pegler (1966, 1977) mentioned smaller basidiospores (9–11.7 × 3.2–4.5 μm) in his original description. However, the type specimen as well as other collections have distinctly larger basidiospores. In other features, all finds agree well with the original description. Collection from Burundi (J. Rammeloo 6716) differs by smaller (10–13 × 4.0–5.0 μm) basidiospores, other characters agree well with this species. Among other species without pleurocystidia and with simple, ± poorly differentiated cheilocystidia, Crinipellis carecomoeis (Berk. & M.A. Curtis) Singer, known from Cuba, Colombia and Mexico, has narrower basidiospores ((9–)13–14.5(–20) × (3.5–)4–5(–6.3) μm), and pileus and stipe hairs not turning green in alcalis; C. gracilis Singer, described from Brazil, differs by having a small, only 1–2 mm broad, white, centrally cinnamon-ochraceous pileus, a smaller stipe (7–8 × 0.1 mm), and slightly smaller basidiospores (9–13.5 × 5–6.5(–7) μm); C. missionensis Singer, from Argentina, by robust basidiocarps (pileus 40 mm broad, stipe 60 × 4 mm), smaller basidiospores ((7.5–)8.2(–9.3) × (5.4–)5.5(–6.8) μm), and pileus and stipe hairs not turning green in alcalis; C. mexicana Singer, collected in Bolivia and Mexico, has smaller basidiocarps (pileus 2–5 mm broad, stipe 9–14 × 0.3–1 mm), smaller basidiospores (7–10 × 3–6.5 μm), and pileus and stipe hairs not turning green in alcalis, and C. austrorubida Singer, described from Argentina, has purple red, smaller basidiocarps (pileus 5–6 mm broad, stipe c. 5 × 0.7 mm), and smaller basidiospores (7–8 × 4.8–6.8 μm) (Singer 1976). Crinipellis brunneipurpurea Corner, known from Indonesia and Malaysia, differs especially by having a smaller, 3–7 mm broad, violet brown, dark ruby or dark purple pileus, its concolorous stipe, and narrower basidiospores (10–14 × 3–5 μm) (Kerekes & Desjardin 2009). Crinipellis ticoi Halling, described from Bolivia, has robust basidiocarps (pileus 10–30(–40) mm broad, stipe (10–)25–70 × (1–)3–4 mm), an orange to pale orange pileus, and differently shaped basidiospores (Halling 1993). Antonín, Verbeken & P. Roberts, in Antonín, Cryptogamie, Mycol. 33(4): in press (2012). – Type: Cameroon, Central Prov., Nsimalen, c. 30 km to S of Yaoundé, 3 Apr. 2001, V. Antonín Cm 01.22 (BRNM 666071, holotype). Ecology. On fallen twigs and branches. Distribution. So far known only from Cameroon. Cameroon. Central Prov., Nsimalen, c. 30 km to S of Yaoundé, 03º 43’ 00’’ N, 11º 32’ 26’’ E, alt. 675–685 m, 3 Apr. 2001, V. Antonín Cm 01.22 (BRNM 666071, holotype). – Prov. de l’Est, Dja Biosphere Reserve, close to Somalomo, 03º 22.15’ N, 12º 44.89’' E, 7 Apr. 2007, A. Verbeken 07-28 (BR 164507-92 ex GENT). – South West Prov., Korup National Park, trail from Rengo camp to Ekunde-Kunde, 9 Apr. 1997, P.J. Roberts K994 (K(M) 91504). Notes. Crinipellis nsimalensis is characterized by moderately large basidiocarps, with a pale coloured, ± strongly glabrescent pileus, rather large basidiospores, well-developed cheilocystidia with apical projections, the absence of pleurocystidia and yellow-brown hairs in KOH. Among species with robust basidiocarps, Crinipellis zonata (Peck) Pat., growing in the USA, Canada, Portugal and the Republic of Korea, has smaller, differently shaped basidiospores (6.6–8.5 × (3.0–)3.5–5.0 μm), and simple cheilocystidia (Antonín & Noordeloos 2010, Redhead 1989); C. sepiaria Pat. & Demange has also small (5.7–7.7 × 4.5–5.7 μm), and differently shaped basidiospores (Kerekes & Desjardin 2009). Crinipellis catamarcensis Singer, described from Argentina, has a rusty brown pileus and stipe, smaller basidiospores (5.5–7.5 × 3.5–4.5 μm), and cheilocystidia without or with one to a few apical projections; C. missionensis Singer, also known only from Argentina, has an even more robust stipe (60 × 4 mm), smaller basidiospores ((7.5–)8.2(–9.3) × (5.4–)5.5(–6.8) μm), and different cheilocystidia (Singer 1976). Crinipellis subtomentosa (Peck) Singer, widespread in Europe and North America, has differently shaped cheilocystidia, and grows on herbaceous debris; C. sardoa Candusso, collected in the Mediterranean area of Europe, has a bright ochraceous and red tinged pileus, and a 3–6 mm wide stipe; moreover, both of them have smaller, differently shaped basidiospores (Antonín & Noordeloos 2010). Antonín & De Kesel, Czech Mycol. 64(2): in press (2012). – Type: Benin, Niaouli, 13 June 1999, A. De Kesel 2525 (BR 112900-89, holotype). Selected descriptions and icons. Antonín & De Kesel, Czech Mycol. 64(2): in press (2012). Ecology. Growing single or in small bundles (2–3 basidiocarps) on fallen twigs or small branches. Distribution. So far, it has been collected only in Benin, where it seems to be rather common. Benin. Niaouli, 13 June 1999, A. De Kesel 2525 (BR 112900-89). – Niaouli, Bas-Fond, 12 June 2000, A. De Kesel 2781 (BR 126334-40). Notes. Crinipellis beninensis is characterized by having a reddish grey to dull red, later paler, and at centre more brownish (greyish brown to reddish brown) pileus, rather small basidiospores, mostly coralloid or branched cheilocystidia, walls of pileus and stipe hairs (greenish?) yellow-brown in H2O and KOH, and by the absence of pleurocystidia. Both collections are both macro- and microscopically fully identical except for the size of basidiospores (A. De Kesel 2781: 7.0–8.5 × 3.5–4.7 μm large; A. De Kesel 2525: 8–10 × 4.0–5.5 μm large). Among tropical African species without pleurocystidia, Crinipellis calderi Pegler differs by a burnt umber to fuscous-black pileus, palescent to light vinaceous-cinnamon or greyish orange at margin, a larger (13–35 × 1–2 mm), at base fuscous-black stipe, larger (12–15 × 5.0–6.5 μm) basidiospores, and only poorly differentiated cheilocystidia (Pegler 1966); C. nsimalensis Antonín & al. has a brown fibrillose-squamulose pileus, a larger (25–60 × 1–2 mm), towards base dark brown stipe, and larger (9.5–11(–12) × (4.0–)4.5–5.5(–6.5) μm) basidiospores; C. ghanaënsis Singer especially differs by a chestnut-brown hairy pileus, and a concolorous stipe (Pegler 1967); C. kisanganensis Antonín & Buyck has a small (only 5–7 mm broad), dark brown pileus, covered with dark brown hairs, a greyish brown, dark brown hairy stipe, narrower (8.0–10 × 3.5–4.75 μm) basidiospores and smaller ((12–)15–26 × 4.5–9.0 μm) cheilocystidia; C. ochracea Antonín & De Kesel differs by a small, 2–7 mm broad, brownish then beige hairy pileus with a central papilla, a towards base dark brown to grey-brown, in old specimens almost black-brown stipe, and simple and irregular cheilocystidia, without or with one or only several apical projections. Among extra-African species with a purple or reddish coloured pileus and without pleurocystidia, Crinipellis brunneipurpurea Corner, known from Indonesia and Malaysia, has a smaller, only 2–7 mm broad pileus, a violet-brown to dark ruby coloured stipe, larger basidiospores (10–14 × 3–5 µm), and mostly simple or only bifurcate cheilocystidia; C. dipterocarpi f. cinnamomea Kerekes & al., collected in Indonesia, Malaysia and Thailand, also a smaller, 1–11 µm broad, reddish brown to cinnamon, later light brown pileus, and smaller cheilocystidia (9–20 × 5–7 µm) with simple projections; C. tabtim Kerekes & al., described from Thailand, differs by a smaller, 1–11 mm broad pileus, basidiospores 8–11 × 4–5.5 mm large with a different Q-ratio (Q = 2.3) and smaller cheilocystidia (10–20 × 5–9 µm) with simple projections (Kerekes & Desjardin 2009). Crinipellis purpurea Singer, collected in Columbia and Bolivia, differs by having a smaller, 6–8 mm broad, purple red pileus with a dark purple to purple-black centre, a concolorous or vinaceous stipe, narrower basidiospores (6.5–10.3 × 3–4.7 µm), and clavate, rarely filamentous or cylindrical cheilocystidia, sometimes with apical digitate projections; C. insignis Singer, described from Bolivia, by a purple or purplish pink pileus, a only up to 9 mm long, yellow and purple coloured stipe, larger basidiospores (10.5–13.5 × 4.5–6.5 µm), and scattered, simple cheilocystidia; C. eggersii Pat., collected in Ecuador, Bolivia and Argentina, by a purple to violet purple pileus, a short and more robust, 2–15 × 0.4–3 mm large stipe, larger basidiospores ((7)11–13 × (4)5.5–6.3(7.5) µm); C. siparunae Singer, from Cuba and Brazil, by a lilac, brownish lilac, livid pink pileus, and larger (9–14 × 4.5–8 µm) basidiospores (Singer 1976). Singer, in Pegler, Kew Bull. 21: 520 (1968). – Type: Ghana, Mpraeso, 1 Aug. 1955, M. Holden GC84 (K(M) 147479, holotype). Selected descriptions and icons. Singer in Pegler, Kew Bull. 21: 520–521 (1968). Ecology. On wood and fallen twigs. Distribution. So far known only from the type locality in Ghana. Ghana. Mpraeso, 1 Aug. 1955, M. Holden GC84 (K(M) 147479, holotype). Notes. Crinipellis ghanaënsis is characterized by having rather robust basidiocarps, moderately large basidiospores, well-developed cheilocystidia with digitate apical projection(s), olivaceous walls of hairs in KOH, and by the absence of pleurocystidia. Among other species also having robust basidiocarps, Crinipellis zonata (Peck) Pat., collected in the USA, Canada, Portugal and the Republic of Korea, has smaller basidiospores (6.6–8.5 × (3.0–)3.5–5.0 μm), and differently shaped cheilocystidia (Antonín & Noordeloos 2010, Antonín & al. 2009, Redhead 1989); C. sepiaria Pat. & Demange has small (5.7–7.7 × 4.5–5.7 μm), broadly ellipsoid to ovoid basidiospores (Kerekes & Desjardin 2009). Crinipellis catamarcensis Singer, described from Argentina, has a rusty brown pileus and stipe, smaller basidiospores (5.5–7.5 × 3.5–4.5 μm) and cheilocystidia without or with one or more apical projections; C. missionensis Singer, also known only from Argentina, has a fuscous pileus, even more robust stipe (60 × 4 mm), smaller basidiospores ((7.5–)8.2(–9.3) × (5.4–)5.5(–6.8) μm), and different cheilocystidia (Singer 1976). Crinipellis subtomentosa (Peck) Singer, widespread in Europe and North America, has differently shaped cheilocystidia, and grows on herbaceous debris; C. sardoa Candusso, collected in the Mediterranean area of Europe, has a bright ochraceous and red tinged pileus, a 3–6 mm wide stipe, and differently shaped cheilocystidia with apical projections (Antonín & Noordeloos 2010). 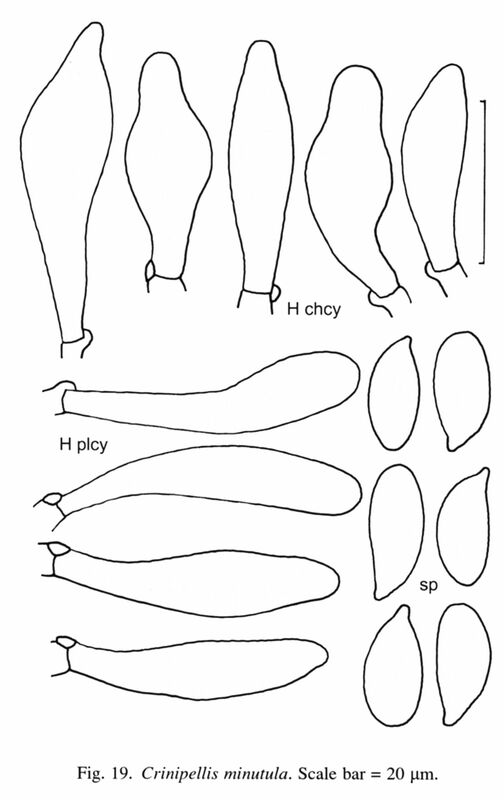 Similar cheilocystidia has C. furcata Kerekes & al., known from Indonesia and Thailand. It, however, has less robust basidiocarps (pileus 6–11 mm broad, stipe (15–)30–40 × 1 mm), a dark brown to nearly black pileus, and slightly smaller basidiospores (6.5–9 × 4–5 μm) (Kerekes & Desjardin 2009). Antonín & Buyck, in Antonín, Cryptogamie, Mycol. 33(4): in press (2012). – Type: Democratic Republic of Congo, Tshopo, Kisangani, 24 Apr. 1984, B. Buyck 1552 (BR 011744-07, holotype). Pileus 5–7 mm broad, convex, with a shallow central depression, covered with dark brown hairs, dark brown (6F6-8) at centre, through brown (6E6-8) to brownish orange (6C4-5) at margin. Lamellae moderately distant, attached, not intervenose, white, with concolorous edge. Stipe up to 35 × 0.5 mm when dry, cylindrical, hollow, laterally compressed, longitudinally striate, densely covered with dark brown hairs, greyish brown (± 6D3). Context thin, white. (According to B. Buyck 1552). Ecology. On fallen leaves and very small twigs. Distribution. So far known only from the Democratic Republic of Congo and Zimbabwe. Democratic Republic of Congo. Tshopo, Kisangani, 00º 31’ N, 25º 11’ E, 24 Apr. 1984, B. Buyck 1552 (BR 011744-07, holotype). Zimbabwe. Beacon Hill, 1930A4, 27 Dec. 1996, C. Sharp 471/96 (BR 152510-26). Notes. Crinipellis kisanganensis is characterized by having small basidiocarps, rather small basidiospores, well-developed cheilocystidia with apical projection, hairs with (yellow-)brown to olivaceous walls in KOH, and the absence of pleurocystidia. Among species with small basidiocarps, rather small basidiospores and no pleurocystidia, Crinipellis foliicola Singer, known from North- and South Americas, has a differently coloured pileus, and hair walls not becoming green in KOH; C. phyllophila Singer, from Mexico, also has a differently coloured pileus, slightly broader basidiospores ((8–)9.3–10.5(–11.2) × (3.7–)4.3–5 μm), and hair walls not becoming green in KOH (Singer 1976). Crinipellis dipterocarpi Singer, differs by slightly broader basidiospores (5–10 × 3.0–5.5 μm), which are more variable in size, and hair walls not becoming green in KOH (Kerekes & Desjardin 2009). Antonín & De Kesel, Cryptogamie, Mycol. 33(4): in press (2012). – Type: Benin, Oueme Prov., Agongo, 17 Aug. 1997, V. Antonín & A. De Kesel (V. Antonín B97.39, BR 101093-19, holotype). Ecology. On fallen small twigs. Distribution. So far known only from the type locality in Benin. Benin. Oueme Prov., Agongo, 6º 22.93’ N, 02º 37.33’ E, 17 Aug. 1997, V. Antonín & A. De Kesel (V. Antonín B97.39, BR 101093-19, holotype). Notes. Crinipellis ochracea is characterized by having small basidiocarps, with a pale coloured pileus, moderately large basidiospores, well-developed cheilocystidia mostly with apical projection(s), the absence of pleurocystidia and walls becoming olivaceous in KOH. Among species with small basidiocarps, rather small basidiospores and absent pleurocystidia, Crinipellis foliicola Singer, known from North- and South Americas, has a darker brown pileus, longer basidiospores ((6.5–)7.2–10.7(–11.5) × (2.5–)3.2–4.8 μm) with a different Q ratio (1.9–2.5), and hair walls not becoming green in KOH; C. phyllophila Singer, from Mexico, also has a differently coloured, ferruginous then cinnamon tan pileus, longer and narrower basidiospores ((8–)9.3–10.5(–11.2) × (3.7–)4.3–5 μm), and hair walls not becoming green in KOH (Singer 1976). Crinipellis dipterocarpi Singer, differs by a light to dark brown pileus, different cheilocystidia, and hair walls not becoming green in KOH (Kerekes & Desjardin 2009). Singer ex Antonín, Cryptogamie, Mycol. 33(4): in press (2012). – Type: Democratic Republic of Congo, Binga, 15 June 1939, M. Goossens-Fontana 2000 (BR 031789-70, holotype). Ecology. Growing in groups in detritus in a dry forest. Distribution. So far known only from the type locality in the Democratic Republic of Congo. Democratic Republic of Congo. Binga, 15 June 1939, M. Goossens-Fontana 2000 (BR 031789-70, holotype). Notes. Crinipellis goossensiae is characterized in having a rather large pileus, small basidiospores, well-developed cheilocystidia with projection(s) or coralloid at apex, distinct, long, mostly fusoid, slightly thick-walled pleurocystidia and hairs with olivaceous walls in KOH. The name Crinipellis goossensiae was mentioned by Singer only on the label of the herbarium specimen in BR, and was validated by Antonín (2012). Crinipellis malesiana Kerekes & al., known from Indonesia, Malaysia and Thailand, has similar thick-walled pleurocystidia. However, it especially differs by having larger basidiospores (8–12.5 × 4–6.5 μm), and usually simple cheilocystidia, only few of them with short apical projections (Kerekes & Desjardin 2009). Crinipellis trichialis (Lév.) Pat. ex Antonín & al., known from South America, has larger, particularly broader basidiospores (7.3–9.7(–10.2) × 4–6.7 μm), smaller pleurocystidia (16–49 × 6.8–8.3 μm), and larger, branched or appendiculate cheilocystidia (13–48 × 5.5–8.3 μm) similar to pleurocystidia (Singer 1976); C. excentrica (Pat. & Gaillard) Pat. has an eccentric stipe and broader basidiospores (7–9.5 × 5–6(–7) μm) (Singer 1976). Patouillard, Essai Taxon. Hyménomycètes: 143 (1900). – Lentinus minutulus Henn., Bot. Jahrb. Syst. 23: 547 (1897). – Naucoria minutula (Henn.) Pilát, Ann. Mycol. 34: 123 (1936). – Phaeomarasmius minutulus (Henn.) Singer, Ann. Mycol. 41: 151 (1943). – non Marasmius minutulus Henn., Bot. Jahrb. Syst. 22: 100. 1896 (1895). – Type: Togo, May 1895, Baumann 5, det. P. Hennings (FH 00301392, holotype). Selected descriptions and icons. Hennings, Bot. Jahrb. Syst. 23: 547 (1897); Singer, Lilloa 8: 509–510 (1943). Pileus 4–15 mm broad when dried, convex or finally expanded, with small papilla in umbilicus-like depression, which is less hairy than the rest of the pileus, the umbo with rather conspicuous hairy tuft (lens), curly-radially-hairy, cinnamon (Hennings 1897), nearly “argus brown” when dry (Singer 1943). Lamellae moderately crowded, not or hardly connected attenuate-free or almost free, with a few lamellulae, rather narrow, yellowish white, yellowish subalutaceous when dry, with concolorous edge. Stipe 4–15 × 0.5–1 mm, central, tomentose, somewhat curved, cylindrical, concolorous with pileus. Context thin, white. (According to Singer 1943). Ecology. Growing in groups on fallen leaves and small twigs. Distribution. So far collected in Gabon and Togo. Gabon. Ogooué-Ivondo Prov., station de Makokou, alt. 470 m, 13 March 2005, S. Dibaluka Mpulusu SDM016 (BR 159811-529). Togo. May 1895, Baumann 5, det. P. Hennings (FH 00301392, holotype). Notes. Crinipellis minutula is characterized in having a rather small, cinnamon pileus, small basidiospores, fusoid, subutriform, less frequently clavate, often (sub)rostrate, smooth cheilocystidia, numerous, 31–51 × 7.5–9.0(–10.5) µm, clavate, subcylindrical, fusoid pleurocystidia, and pileus and stipe hairs with hyaline to pale yellow-brown walls sometimes olivaceous tinged in KOH. One collection from Tanzania identified as Crinipellis minutula by D.N. Pegler has been found during a revision of Crinipellis specimens in the Kew herbarium. Therefore, the type specimen of Lentinus minutulus Henn. has been revised. The type revision showed that this fungus belongs to the genus Crinipellis, however, it is different from the above mentioned Tanzanian record (cf. C. minutuloides). Among other species with well-developed pleurocystidia, Crinipellis malesiana Kerekes & al., collected in Indonesia, Malaysia and Thailand, differs by having a brown, then centrally dark brown and marginally brown to brownish orange pileus, larger basidiospores (8–12.5 × 4–6.5 μm), thick-walled and not refractive pleurocystidia, and pileus and stipe hairs becoming greenish in KOH; C. trichialis (Lév.) Pat. ex Antonín & al., known from Brazil, Indonesia, Malaysia and Venezuela, by a dark brown pileus, larger basidiospores (6–11 × 5–8 μm), often apically branched cheilocystidia, larger pleurocystidia (31–60 × 6–9 μm), and pileus and stipe hairs becoming greenish in KOH (Kerekes & Desjardin 2009). Crinipellis commixta Singer, known from Argentina and Chile, has frequently apically branched cheilocystidia, and smaller (27–37 × 5–6 μm), sometimes apically forked pleurocystidia; C. alcalivirens Singer, described from Colombia, has broader basidiospores (7.5–8.5 × 4.5–5.7 μm), and often apically forked cheilocystidia; C. sapindacearum Singer, from Brazil, has a very small, only 3–5 mm broad pileus glabrescent at centre, a smaller stipe (9–14 × 0.4–0.5 mm), cheilocystidia with apical projections, and smaller pleurocystidia (18–24 × 5.3–9(–12) μm); C. tucumanensis Singer, collected in Argentina, has a fulvous-brown pileus, broader basidiospores (5.5–8.5 × 4–6 μm), and cheilocystidia with apical projections (Singer 1976). Singer, Lilloa 8: 510 (1943). – Marasmius pseudosplachnoides Henn., Bot. Jahrb. Syst. 30: 47 (1901). – Type: Cameroon, Bipinde, May 1899, G. Zenker 2041 (BR 031798-79, lectotype selected here; S, K(M) 108875 isotypes). Selected descriptions and icons. Hennings, Bot. Jahrb. Syst. 30: 47 (1901); Pegler, Kew Bull. Addit. Ser. 6: 212–213 (1977); Singer, Lilloa 8: 510 (1943). Ecology. On leaf and plant litter, wood remnants and fruits. Distribution. It was so far collected in Cameroon, Democratic Republic of Congo, Niger, Nigeria and Uganda. It seems to be widely distributed in tropical Africa. Benin. ? Kikélé 1, 13 June 2002, A. De Kesel 3388 (BR 152098-02). – Kpéssou–Samari, 23 June 2000, A. De Kesel 2858 (BR 126411-20). Cameroon. Prov. de l´Est, Somalomo Distr., Dja Biosphere Reserve, near Somalomo, 6 Apr. 2007, D. Stubbe DS07329 (BR 164447-32). – Ibid., 6 Apr. 2007, A. Verbeken 07-16 (BR 164519-07 ex herb GENT). – Bipinde, May 1899, G. Zenker 2041, in Zenker, Flora von Kamerun (BR 031798-79, lectotype; S, K(M) 108875 isotypes). – ? South West Prov., Korup National Park, trail from Rengo camp to Ekundu-Kundu, alt. 100 m, 4 May 1996, P.J. Roberts K463, det. D.N. Pegler (K(M) 39595, as C. pseudostipitaria). Democratic Republic of Congo. Kipopo, 23 Dec. 1960, M.C. Schmitz-Levecq 261 (BR 031793-74). – ? Kipopo, 14 Oct. 1960, M.C. Schmitz-Levecq 243 (BR 031794-75). Niger. Tillabery, Say, W National Park, Mekrou, 12º28'29'' N, 02º25'29'' E, 6 Aug. 2010, O. Hama, P.P. Daniëls, M. Barage, D. Ibrahim & M. Rosas (O. Hama 342, COFC 5099). Nigeria. Cross River State, Calabar–Cameroon road, 4 July 1990, R.A. Nicholson 687 (K(M) 23072, as C. pseudostipitaria). – Ibid., 23 June 1990, R.A. Nicholson 550 (K(M) 18631, as C. stipitaria). – Ibid., Oban forest, 3 Aug. 1990, R.A. Nicholson 682 (K(M) 23073, as C. pseudostipitaria). – ? Ibid., Ito Bridge, Uyo–Calabar road, 13 June 1989, R.A. Nicholson 272 (K(M) 7734). Uganda. Buganda Prov., Mengo Distr., Mabira Forest, alt. 1214 m, 9 June 1968, D.N. Pegler U1362 (K(M) 147482). – Ibid., Mawakota Co., Mpanga Research Forest, alt. 1250 m, 13 June 1968, D.N. Pegler U1455 (K(M) 147483). Notes. Crinipellis pseudosplachnoides is characterized by a pale brown pileus, darker at centre to almost cream at margin, white or whitish lamellae, a rather long stipe, moderately long and rather wide, non-dextrinoid basidiospores, mostly simple cheilocystidia, cylindrical or (narrowly) clavate pleurocystidia, and pileus and stipe hairs with olivaceous tinge in KOH. Pegler (1977), who revised the type specimen (Zenker, Flora von Kamerun) from the S herbarium, mentioned that it is sterile, and the basidiospores details given by Hennings (1901) refer to a Penicillium species. Pegler has taken the description of basidiospores from his collection K144 from Kenya which was revised by the author. The author revised the syntype specimen (K(M) 108875), and showed narrower (9.0–11.5 × 4.5–5.0 μm), cylindrical-ellipsoid or ellipsoid-fusoid basidiospores, however, this type specimen is in a poor condition, and is impossible to decide if it really agrees with the current concept of this species. The syntype specimen preserved at the BR herbarium (BR 031798-79), consisting of three basidiocarps, is the best seen one, and it is selected as a lectotype here. However, basidiocarps are also sterile and damaged by a mould, nevertheless, cheilo- and pleurocystidia are ± well preserved. Cheilocystidia are 25–33 × 8.0–12 µm large, clavate, fusoid, mostly simple, rarely with short apical projections or lobed, and pleurocystidia scattered, clavate or fusoid, 33–35 × 6.0–11 µm (only two ones seen). Collection Nicholson 272 from Nigeria is included with a question mark here because of a different pileus width:stipe length ratio; A. De Kesel 3388 and 2858 collections from Benin also are with a question mark here because of the broader basidiospores: 10.5–12 × (4.5–)5.0–6.0 µm, Q = 2.03–2.15. Among species with well-developed pleurocystidia, Crinipellis malesiana Kerekes & al., collected in Indonesia, Malaysia and Thailand, differs by having a brown, then centrally dark brown and marginally brown to brownish orange pileus, slightly longer basidiospores (8–12.5 × 4–6.5 μm), and thick-walled, not refractive pleurocystidia; C. trichialis (Lév.) Pat. ex Antonín & al., known from Brazil, Indonesia, Malaysia and Venezuela, has different basidiospores (6–11 × 5–8 μm) (Kerekes & Desjardin 2009). Crinipellis commixta Singer, known from Argentina and Chile, has slightly smaller basidiospores (6.7–9.5 × (3–)4–5.5 μm), shorter (27–37 × 5–6 μm), sometimes apically forked pleurocystidia, and pileus and stipe hairs not becoming green in KOH; C. alcalivirens Singer, described from Colombia, has a rusty to chestnut brown pileus, smaller basidiospores (7.5–8.5 × 4.5–5.7 μm), and smaller pleurocystidia (28–38 × 5.5–7.5 μm); C. sapindacearum Singer, from Brazil, a small, only 3–5 mm broad pileus, glabrescent at centre, a smaller stipe (9–14 × 0.4–0.5 mm), smaller basidiospores (7.5–8.2 × 3–3.5 μm), and smaller pleurocystidia (18–24 × 5.3–9(–12) μm); C. tucumanensis Singer, collected in Argentina, has a differently coloured pileus, smaller basidiospores (5.5–8.5 × 4–6 μm), and smaller pleurocystidia (27–45 × 7–10.7 μm) (Singer 1976). Crinipellis scabellus (Alb. & Schwein. : Fr.) Murrill (= C. stipitarius (Fr.) Pat. ), collected in Europe, may be very similar. It has slightly shorter and narrower basidiospores ((6.5–)7.5–9.5(–10.5) × (4.0–)4.5–6.0(–8.0) µm) with a different Q-ratio (Q = only 1.7), and cheilocystidia often bifurcate or with a few projections at apex (Antonín & Noordeloos 2010). Singer, Lilloa 8: 470 (1943). Antonín, Cryptogamie, Mycol. 33(4): in press (2012). – Crinipellis pseudostipitaria ssp. orientalis Singer, Lilloa 8: 472 (1943). – Type: Guinea, Camayenne, 1909 (1904? ), Dupont s.n., det. N. Patouillard (FH 00301393, isotype). – Congo, Cap Lopez, Feb. 1894, Dybowski s.n. , det. N. Patouillard (FH 00301395, paratype). Selected descriptions and icons. Antonín, Cryptogamie, Mycol. 33(4): in press (2012); Singer, Lilloa 8: 472–473 (1943). Ecology. On twigs, bamboo, plant and grass stems, in remnants of a montane forest with Widdringtonia and Podocarpus, and in a primary rain forest with Gilbertiodendron and Scaphopetalum. Distribution. So far collected in Burundi, Democratic Republic of Congo, Gabon, Guinea, Malawi, Rwanda, and Tanzania. Burundi. T. Muramwya Prov., Teza, 03º 13’ S, 29º 34’ E, 16 Dec. 1978, J. Rammeloo 6121 (BR 011900-66). Democratic Republic of Congo. Vicinity of Kisangani, 5 km NNE of Batiabongena, 27 Apr. 1984, B. Buyck 1599B (000128-31). Gabon. Cap Lopez, Feb. 1894, Dybowski s.n., det. N. Patouillard (FH 00301395, paratype). Guinea. Camayenne, 1909 (1904? ), Dupont s.n. (FH 00301393, isotype). Malawi. Zomba, Chifundi, 12 Dec. 1981, B. Morris 307 (K(M) 147490, Morris 1990). – Mt. Mulanje, near Linje river, alt. 2000 m, 15º 59’ S, 35º 32’ E, 17 Nov. 1981, J. Rammeloo 7401 (BR 011971-40). – Lichenya plateau, along a Boma path, 15º 59’ S, 35º 37’ E, 19 Nov. 1981, J. Rammeloo 7439 (BR 011979-48). – Near Lichenya river, 15º 58’ S, 35º 34’ E, alt. 1750 m, 6 Nov. 1981, J. Rammeloo 7198 (BR 011956-25). – Mt. Mulanje, from C.C.A.P. hut to Lychenya hut, 15º 59’ S, 35º 32’ E, alt. 2000 m, 18 Nov. 1981, J. Rammeloo 7429 (BR 011976-45). – Nyika National Park, Gîte Chelinda, alt. 2300 m, 5 Dec. 1981, J. Rammeloo 7667 (BR 011991-60). Rwanda. Sabinyo Volcano, 7 Oct. 1974, J. Rammeloo 4911 (BR 0031791-72). Tanzania. Northern Prov., Arusha Distr., Arusha Nat. Park, Mt. Meru, Jekukurina camp, alt. 2134 m, 30 May 1968, D.N. Pegler U1455 (K(M) 147484). Notes. Crinipellis pseudostipitaria var. orientalis is characterized by having a brown or fulvous-brown pileus and stipe, rather broad basidiospores, mostly apically branched cheilocystidia and simple, clavate, cylindrical or fusoid pleurocystidia, and pileus and stipe hairs usually turning green in KOH. Crinipellis pseudosplachnoides differs in having a long stipe in comparison with a pileus diameter, narrower basidiospores, and mostly simple cheilocystidia. Among species from other continents with well-developed pleurocystidia, Crinipellis malesiana Kerekes & al., collected in Indonesia, Malaysia and Thailand, differs by having a brown, then centrally dark brown and marginally brown to brownish orange pileus, larger basidiospores (8–12.5 × 4–6.5 μm), and thick-walled, not refractive pleurocystidia; C. trichialis (Lév.) Pat. ex Antonín & al., known from Brazil, Indonesia, Malaysia and Venezuela, has a dark brown pileus, and slightly broader basidiospores (6–11 × 5–8 μm) (Kerekes & Desjardin 2009). Crinipellis commixta Singer, known from Argentina and Chile, has slightly smaller basidiospores (6.7–9.5 × (3–)4–5.5 μm), and narrower (27–37 × 5–6 μm), sometimes apically forked pleurocystidia; C. alcalivirens Singer, described from Colombia, has smaller basidiospores (7.5–8.5 × 4.5–5.7 μm); C. sapindacearum Singer, from Brazil, a very small, only 3–5 mm broad pileus glabrescent at centre, a smaller stipe (9–14 × 0.4–0.5 mm), smaller basidiospores (7.5–8.2 × 3–3.5 μm), and smaller pleurocystidia (18–24 × 5.3–9(–12) μm); C. tucumanensis Singer, collected in Argentina, has a fulvous-brown pileus, and smaller basidiospores (5.5–8.5 × 4–6 μm) (Singer 1976). Crinipellis scabellus (Alb. & Schwein. : Fr.) Murrill (= C. stipitarius (Fr.) Pat. ), collected in Europe, is very similar. It differs by having slightly shorter and narrower basidiospores ((6.5–)7.5–9.5(–10.5) × (4.0–)4.5–6.0(–8.0) µm) and cylindrical to fusoid cheilocystidia, simple or often only bifurcate or with a few projections at apex (Antonín & Noordeloos 2010). Singer (1943) has not mentioned the presence of pleurocystidia in his descriptions. However, the type revision showed their presence. Revision of type (Fig. 22): basidiospores (8.0–)8.5–10.5 × (5.0–)5.5–6.5 µm, average 8.9 × 6.0 µm, E = 1.33–1.70, Q = 1.51 (var. orientalis), and 7.0–9.5 × 4.2–5.5 µm, average 8.2 × 4.8 µm, E = 1.40–2.0, E = 1.71 (var. mesites, see below), ellipsoid, ellipsoid-fusoid, thin- and slightly thick-walled, non-dextrinoid. Basidium (only one observed) 31 × 11 µm, 4-spored. Basidioles 15–35 × 4.0–11 µm, clavate, fusoid, subcylindrical. Cheilocystidia 15–30(–35) × 5.5–10 µm, clavate, cylindrical, subfusoid, mostly with apical projections, rarely simple, thin-walled, clamped. Pleurocystidia 32–42 × 5.5–9.0(–10) µm, narrowly clavate, subcylindrical, less frequently narrowly fusoid, thin-walled, (slightly) refractive. Tramal hyphae ± cylindrical, thin- to slightly thick-walled, clamped, non-dextrinoid, up to 12 µm wide. Pileipellis a cutis composed of cylindrical to subinflated, often slightly thick-walled, smooth, non-dextrinoid, up to 10 µm wide hyphae. Pileus hairs up to c. 300 × 4.0–12 µm, cylindrical, thick-walled (walls up to 3.0 µm), dextrinoid, with walls subhyaline to pale yellow, sometimes olivaceous tinged in KOH. Stipitipellis a cutis of cylindrical, parallel, slightly thick-walled (walls up to 1.0 µm), dextrinoid, up to 5.0 µm wide hyphae. Stipe hairs similar to pileus ones. Singer, Lilloa 8: 471 (1943). - Type: Western Africa, Niger-valley, Chevalier s.n. (FH 00301394, isotype). Selected descriptions and icons. Singer, Lilloa 8: 471–472 (1943). Ecology. Growing on Andropogon and other dead grass stems, fallen twigs of Acacia xanthophaea and some other trees and shrubs, and on dead culms of Sporobolus greenwayi and S. piramidalis. Distribution. It is a widely distributed taxon in tropical Africa, so far collected in Benin, Cameroon, Democratic Republic of Congo, Ghana, Kenya, Malawi, Nigeria, Tanzania, Uganda, and ‘Western Africa’. Benin. Atacora Prov., Kota, 24 Aug. 1997, V. Antonín B97.96 (BR 101141-67). Cameroon. South West Prov., Mt. Cameroon, Idenau, 16 Oct. 1995, S. Dawson 32, det. D.N. Pegler (K(M) 34544). – ? South West Prov., Korup National Park, Transect P, alt. 50 m, 26 Apr. 1996, P.J. Roberts K132, det. D.N. Pegler (K(M) 39486). – Prov. de l´Est, Dja Biosphere Reserve, Somalomo distr., Messamena vicinity, 4 Apr. 2007, D. Stubbe DS07324 (BR 164452-37). Democratic Republic of Congo. Near the Stanley Falls, 00º 30’ N, 25º 12’ E, Febr. 1896, A. Dewèvre 57 (BR 031785-66, as C. caulicinalis). Ghana. Cape Coast, University Cape Coast Campus, 3 June 1975, A.C. Rose CC7409A, det. D.N. Pegler (K(M) 163499, as C. stipitaria). – Cape Coast, near Itwe, 18 March 1975, A.C. Rose CC7506, det. D.N. Pegler (K(M) 163504, as C. pseudostipitaria). – Gold Coast, Aburi, 27 Sept. 1923, W.H. Patterson (K(M) 163502, ex herb. IMI 38991, as C. pseudostipitaria ssp. orientalis). Kenya. Rift Valley Prov., Naivasha Distr., Eburn Mts., saddle between Man forest and Eburu forest, alt. 2438 m, 20 March 1968, D.N. Pegler K144 (K(M) 147485). Malawi. Zomba, Chifundi, 12 Dec. 1981, B. Morris 307 (K(M) 147490, as C. pseudosplachnoides). Nigeria. Cross River State, Uyo–Calabar road, 22 July 1990, R.A. Nicholson 649, det. D.N. Pegler (K(M) 16685). – Ibid., Uyo, 12 May 1985, R.A. Nicholson 28, det. D.N. Pegler (K(M) 163501, as C. stipitaria). – Ibid., Itu Bridge, 1 July 1990, R.A. Nicholson 561, det. D.N. Pegler (K(M) 16771). – Akwa Iban State, Anua Ravine, 19 Apr. 1989, R.A. Nicholson 149, det. D.N. Pegler (K(M) 14280). Tanzania. Tanga Prov., Lushoto Distr., East Usambara Mts., between Muheba and Amani, Beko, alt. 304 m, 16 Apr. 1968, D.N. Pegler T507 (K(M) 147476, as C. stipitaria). – Northern Prov., Arusha Distr., Arusha Nat. Park, Mt. Meru, Jekukurina camp, alt. 1600 m, 30 May 1968, D.N. Pegler T1209 (K(M) 147477, as C. stipitaria). Uganda. Bukoko Co., Masaka, 1 km E of Buyaga, 20 Dec. 1970, K. Arustei Lye s.n. (M(K) 163500, as C. stipitaria). ‘Western Africa’. Niger-valley, Chevalier s.n., det. N. Patouillard (FH 00301394, isotype, originally as C. stipitaria var. andropogon). Notes. 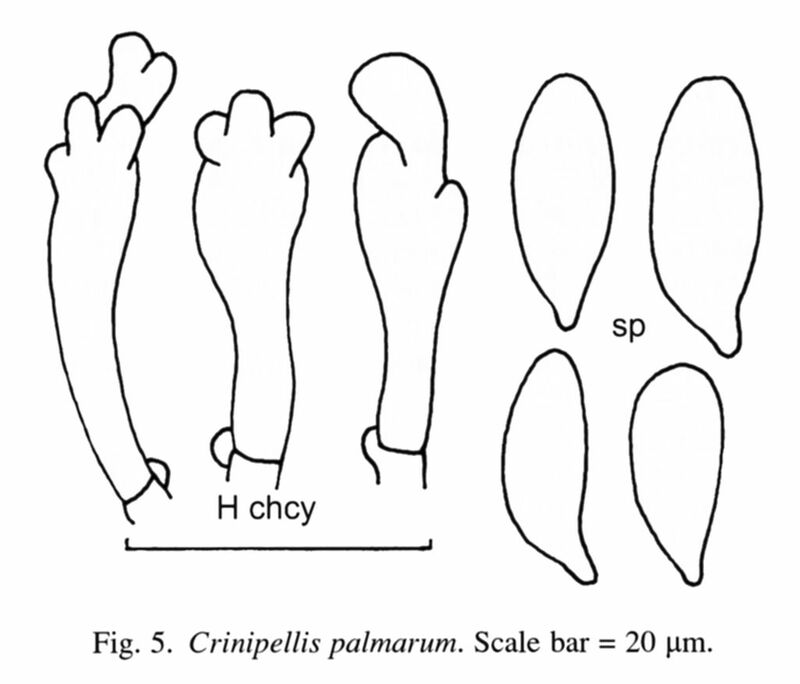 Pegler (1977) published several Crinipellis collections under the name C. stipitaria (Fr.) Pat. Their revision showed that they belong to C. pseudostipitaria var. mesites. Chaetocalathus Singer, Lilloa 8: 518 (1943). – Type species: Chaetocalathus craterellus (Durieu & Lév.) Singer. Basidiocarps pleurotoid, attached to substrate with margin of pileus or a stipe rudiment. Pileus tomentose to scaly, often ± glabrescent with age. Lamellae well-developed. Stipe absent, rudimentary and only present in form of a pseudostipe. Spore print white. Basidiospores ellipsoid, ovoid, hyaline, thin- or slightly thick-walled, smooth. Basidia 4-, less frequently 2-spored. Cheilocystidia always present. Pleurocystidia present or absent. Pileipellis covered with thin- to thick-walled, smooth, setoid hairs. Clamp connections abundant. Chemical reactions. Spores non-dextrinoid or dextrinoid, cyanophilic, cystidia dextrinoid or non-dextrinoid, pileus setoid hairs dextrinoid to almost amyloid, hyphae non-dextrinoid. Ecology. Saprotrophic on debris of phanerogams (wood, bark, leaves, sticks, stems, etc.). Notes. Chaetocalathus is very close to Crinipellis, and differs only by having a pleurotoid habit with a reduced stipe. For detailed notes to Chaetocalathus systematics and taxonomy, see Antonín & Noordeloos (2010). Species are widespread, almost cosmopolitan, but predominantly tropical, absent in large areas of temperate zone. Singer, Lilloa 8: 521 (1943). – Pleurotopsis niduliformis Murrill, North Amer. Fl. 9(4): 238 (1915). – Lachnella niduliformis (Murrill) Locq., Bull. Soc. Mycol. Fr. 68: 166 (1952). – Type: Bermuda, on fallen dead twigs of Juniperus barbadensis, 29 Nov.-14 Dec. 1912, S. Brown, N.L. Britton & F.J. Seaver 1350 (NY 775376, holotype). Selected descriptions and icons. Murrill, North Amer. Fl. 9(4): 238 (1915); Pegler, Kew Bull. 21: 515–516 (1968); Pegler, Kew Bull. Addit. Ser. 6: 206–207 (1977); Singer, Lilloa 8: 521–522 (1943); Singer & Grinling, Persoonia 4: 361 (1967). Ecology. Growing on dead fallen branches and twigs of various trees (e.g. Uvaria chamae, Morinda geminata). Distribution. It has been collected in Burundi, Cameroon, Democratic Republic of Congo, Ghana, Kenya, Nigeria, Sierra Leone, Tanzania, Uganda, and probably also in Angola. Angola: ? Golungo Alto Prov., Cungulungulu, Febr. 1855, ‘CW’ (F. Welwitsch Iter Angolense 342; K(M) 163482, as C. semisupinus). Burundi. Kigwena, Kigwena forest, 22 Febr. 1979, J. Rammeloo 6713 (BR 031227905). – Ibid., 4 Dec. 1978, J. Rammeloo 6027 (BR 031226-89). – Ibid., 20 Dec. 1979, J. Rammeloo 6671 (BR 031230936). – Bururi Prov., Siguvyaye valley, W of the Mutambara-Bururi road, 2 Feb. 1979, J. Rammeloo 9489 (BR 013426-40). – Ibid., J. Rammeloo 6479 (BR 031229923). Cameroon. Prov. de l’Est, Dja Biosphere Reserve, Somaloma Distr., vicinity of Messamena, along the trail between the slack-and-burn fields towards Uapaca stand along side Dja, 03º 23.65’ N, 12º 43.37’ E, 6 April 2007, D. Stubbe DS07331 (BR 164445-30, ex GENT). – South West Prov., Korup National Park, trail from Mana Bridge to Transect P, alt. 50 m, 28 Apr. 1996, P.J. Roberts K228, rev. D.N. Pegler (K(M) 42104). Democratic Republic of Congo. Leopoldville Prov., Kinanga, E 15°12’, S 05°11’, 11 April 1910, H. Vanderyst, det. R. Singer (BR 031228919). – Plateau de Mubila, alt. 1500 m, 4 Nov. 1977, D. Thoen 4944 (K(M) 163485). – Lac Ma Vallée, Kimwenza, 25 May 2005, S. Dibaluka Mpulusu 101 (BR 166809-66). Ghana. Cape Coast, near Jakwa, 25 March 1967, A.C. Rose CC6714 (K(M) 163483). Kenya. Nyanza Prov., Kericho Distr., Kiguru river, alt. 2042 m, 25 March 1968, D.N. Pegler K235 (K(M) 14768). Nigeria. Cross River State, Anua ravine, Uyo, 10 June 1989, R.A. Nicholson 220, det. D.N. Pegler (K(M) 7624). – Akwa Ibam State, Anua ravine, 27 May 1989, R.A. Nicholson 207, det. D.N. Pegler (K(M) 7571). – Ibid., Uyo, 10 June 1989, R.A. Nicholson 223, det. D.N. Pegler (K(M) 7653).– Cross River State, Calabar-Cameroon road, 23 June 1990, R.A. Nicholson 536, det. D.N. Pegler (K(M) 16582). – Ibid., 23 June 1990, R.A. Nicholson 540, det. D.N. Pegler (K(M) 16555). – Cross River State, Calabar-Ikom road, 17 July 1990, R.A. Nicholson 634 (K(M) 16580). – Cross River State, Uyo-Calabar road, 8 June 1990, R.A. Nicholson 575, det. D.N. Pegler (K(M) 16732). – Ibid., 1 July 1990, R.A. Nicholson 573, det. D.N. Pegler (K(M) 18633). – Cross River State, Ikom bridge, Cross River, 1 May 1990, R.A. Nicholson 419 (K(M) 16789). – Cross River State, Uyo, Anua, St. Lerkes Hospital, 2 July 1985, R.A. Nicholson 85 (K(M) 163493, as C. africanus). – Cross River State, Ekpri Nsukara, 22 Apr. 1990, R.A. Nicholson 566, det. D.N. Pegler (K(M) 16653). Sierra Leone. Magbema, Kambia, 24 May 1953, F.C. Deighton M5235 (K(M) 147473). – Njala, 4 May 1954, F.C. Deighton 5914(A) (K(M) 147471). – Njala, Kori, 4 May 1954, F.C. Deighton M5911 (K(M) 147472). Tanzania. Northern Prov., Arusha Distr., Arusha National Park, Mt. Meru, alt. 2652 m, 28 May 1968, D.N. Pegler T1145 (K(M) 147470). Uganda. Buganda Province, Mengo Distr., Mewakota Co., Mpanga Research Forest, 11 June 1968, D.N. Pegler U1393 (K(M) 147467). Bermuda. On fallen dead twigs of Juniperus barbadensis, 29 Nov.-14 Dec. 1912, S. Brown, N.L. Britton & F.J. Seaver (F.J. Seaver 1350, holotype, NY 775376). Notes. Chaetocalathus niduliformis is characterized by having small, sessile, white basidiocarps without stipe (or with a small rudiment of it), by the presence of mostly lobate to apically branched cheilocystidia (broom cells), and the absence of pleurocystidia. Our description agrees well with those by Pegler (1968, 1977) except for longer pileus hairs; Pegler mentioned them only up to 300 μm long. A distinctly broader variability of cheilocystidia shape and thickness of their walls was found. In some finds, cheilocystidia are developed in the form of typical, thin- to slightly thick-walled broom cells with more projections, in other ones in the form of thick-walled cells with one to four thick-walled and often incrusted projections. However, both forms may be developed in some collections. In some collections from Nigeria (R.A. Nicholson 223, 540 & 566), scattered slightly thick-walled (up to 0.5 μm) cells of the same size and shape as basidioles originating from thick-walled hyphae present in the lamella trama. Singer (1943) mentioned, that the original description of C. niduliformis (as Pleurotopsis niduliformis) by Murrill (Murrill 1915) agrees well with the recent concept of this species, however, the type specimen (Seaver 1350) represents a different taxon. Therefore, the type specimen has been revised. Our revision of the holotype material showed that it fully agrees with the current concept of Chaetocalathus niduliformis (e.g. Pegler 1967, Antonín 2012). Chaetocalathus niduliformis var. bisporus Antonín & Rammeloo differs from the typical variety in having 2-spored basidia and larger, 9.0–11 × 6.5–8.0 μm basidiospores. So far, it has been collected only in Mauritius (Antonín 2012). Singer, Lilloa 8(1942): 525 (1943). – Crinipellis africana Pat., Bull. Soc. Mycol. Fr. 8(2): 52 (1892). – Marasmius africanus (Pat.) Sacc., Syll. Fung. 11: 38 (1895). – Chamaeceras africanus (Pat.) Kuntze, Rev. Gen. Plant. 3: 455 (1898). – Lachnella africana (Pat.) Locq., Bull. Soc. Mycol. Fr. 68: 166 (1952).
? Marasmius paradoxus Henn., Bot. Jahrb. Sys. Pflanzengesch. Pflanzengeogr. 22: 101 (1895). – Chamaeceras paradoxus (Henn.) Kuntze, Rev. Gen. Plant. 3: 456 (1898). – Type: Republic of Congo (Congo-Brazzaville), Loango to Brazzaville road, 1891, J. Dybowski s.n. (isotype, K(M) 163489). Selected descriptions and icons. Patouillard, Bull. Soc. Mycol. Fr. 8(2): 52–53 (1892); Pegler, Kew Bull. Addit. Ser. 6: 208 (1977); Singer, Lilloa 8: 525–526 (1943). Ecology. Growing on dead, small, hanging, standing or lying branches or twigs in a primary forest (e.g. Gilbertiodendron dewevrei stand), on lianes in an inundated forest with Lannea and Pseudosapindias, and a secondary stand of Uapaca. Distribution. It is a widely distributed species in tropical Africa known from Cameroon, Republic of Congo, Republic of Côte d'Ivoire, Democratic Republic of Congo, Ghana, Liberia (Singer 1943), Nigeria, and Uganda. Cameroon. Prov. de l´Est, Dja Biosphere Reserve, Somalomo distr., Messamena vicinity, N 03° 22.15’, E 12° 44.89’, 7 Apr. 2007, D. Stubbe DS07336 (BR 164440-25, ex GENT). – Ibid., alt. c. 675 m, 4 Apr. 2007, A. Verbeken 07-03 (BR 164532-20, ex GENT). – South West Province, Korup National Park, transect P, alt. 50 m, 2 Apr. 1997, P.J. Roberts K762 (K(M) 49708). – Bipinde, Urwaldgebiet, 1899, in G. Zenker, Flora von Kamerun (isotype of Panus (Lentinus) paradoxus Henn. 1897, K(M) 92594). Republic of Congo. Loango to Brazzaville road, 1891, J. Dybowski s.n. (isotype, K(M) 163489, as Crinipellis africanus). Republic of Côte d'Ivoire. Boumoukrou, Jan. 1907, A. Chevalier s.n. (K(M) 163488 and PC, as Crinipellis africanus). – Besso Forest, 31 March 1975, L. Aké Assi 334 (K(M) 163487). Democratic Republic of Congo. Kivu Prov., Lesse, virgin forest at margin of Semliki, 24 March 1914, J. Bequaert 3186, det. D.N. Pegler (BR 031223-86). – Yangambi, Ile Esali, 15 Oct. 1938, J. Louis 11767 (BR 031224-87). – Chinganga, A. Dewèvre 9 (BR 031222-85). – Bumbuli, 15 Nov. 1932, J. Lebrun 6579 (BR 031221-84). Ghana. Abe, 15 May 1949, S.J. Hughes 737 (K(M) 163495). – Ibid., 15 May 1949, S.J. Hughes 648 (K(M) 163490, ex herb. Gold Coast 245, IMI 38186). – Cape Coast, wood nearby Kakonido, 23 May 1970, A.C. Rose CC7005 (K(M) 163492). – Near Beposo, 8 June 1966, A.C. Rose CC2 (K(M) 163497). – ? Near Asebu, 6 June 1966, A.C. Rose B11 (K(M) 163484). Nigeria. Ibadan, Ile-Ife, 23 May 1968, M.H. Zoberi 345 (K(M) 163491). – Oyo Prov., Ibadan Distr., Odo Ona Nla, 10 Dec. 1947, J.M. Waterston 868 (K(M) 163496). – Cross River State, Oban Forest, 19 June 1990, R.A. Nicholson 474, det. D.N. Pegler (K(M) 16842). – Cross River State, Calabar-Cameroon road, 23 June 1990, R.A. Nicholson 537, det. D.N. Pegler (K(M) 17077). – Cross River State, Uyo-Calabar road, 8 June 1990, R.A. Nicholson 519, det. D.N. Pegler (K(M) 17073). Uganda. Budongo Forest, W of Masindi, N 01° 44’, E 31° 35’, 3500 ft., 30 July 1966, R.F. Cain, H.D. Griffin & J.C. Krug TRTC 66.830 (K(M) 147467). Notes. Chaetocalathus africanus is characterized by having broadly ellipsoid to subglobose basidiospores, clavate, subcylindrical, subfusoid cheilocystidia in the form of broom cells or with coralloid apex, and sometimes two types of pleurocystidia. A description by Pegler (1977) differs by indicating slightly larger basidiospores (7–9.2 × 5–6.5 μm), which should be only non-dextrinoid, and by the absence of hair-like pleurocystidia. Singer (1943) mentioned smaller, only non-dextrinoid basidiospores (6.5–8.5 × 4.8 μm). “Marasmius” paradoxus Henn. probably also belongs here. Its microscopic characters agree well with C. africanus, with the exception of basidiospore size (6.0 × 3.5 μm). However, only one spore has been found. Singer, Lilloa 8(1942): 524 (1943). – Crinipellis congoana Pat., Bull. Soc. Mycol. Fr. 11: 85 (1895). – Type: Republic of Congo (Congo-Brazzaville), Région littorale, Jan. 1894, J. Dybowski s.n. (isotype, K(M) 163486). Selected descriptions and icons. Patouillard, Bull. Soc. Mycol. Fr. 11: 85 (1895); Singer, Lilloa 8: 524–525 (1943). Distribution. This species is probably known only from the type locality in the Republic of Congo. Republic of Congo. Région littorale, Jan. 1894, J. Dybowski s.n. (isotype, K(M) 163486, as Crinipellis congoana). Notes. Chaetocalathus congoanus is macroscopically very similar to C. africanus, however, it differs microscopically by the more ellipsoid, slightly longer and narrower basidiospores, smaller cheilocystidia, and the absence of pleurocystidia. Its cheilocystidia are similar to pleurocystidia of some collections of C. africanus. It is an insufficiently known fungus known probably only from the type specimen. It is necessary to re-collect this fungus for the final decision about its taxonomic position. Aime M.C. & Philips-Mora W. (2005) The causal agent of witches’ broom and frosty pod rot of cacao (chocolate, Theobroma cacao) form a new lineage of Marasmiaceae. Mycologia 97(5): 1012–1022. Antonín V. (2007) Monograph of Marasmius, Gloiocephala, Palaeocephala and Setulipes in Tropical Africa. Fungus Flora of Tropical Africa 1: 1–164. Antonín V. & De Kesel A. 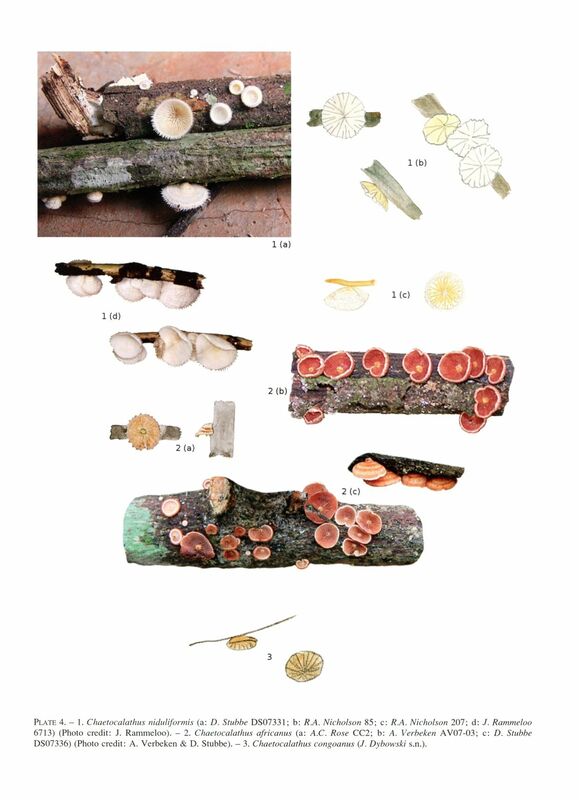 (2012) Crinipellis beninensis (Basidiomycota, Agaricales, Marasmiaceae), a new species from Benin (tropical Africa). Czech Mycol. 64(2) (in press). Antonín V. & Noordeloos M.E. (1997) A monograph of Marasmius, Collybia and related genera in Europe. Part 2: Collybia, Gymnopus, Rhodocollybia, Crinipellis, Chaetocalathus, and additions to Marasmiellus. Libri Botan. 17: 1–256. Antonin V. & Noordeloos M.E. (2010) A monograph of marasmioid and collybioid fungi in Europe. IHW-Verlag, Eching, 480 p.
Antonín V., Ryoo R. & Shin H.D. (2009) Marasmioid and gymnopoid fungi of the Republic of Korea. 1. Three interesting species of Crinipellis (Basidiomycota, Marasmiaceae). Mycotaxon 108: 429–440. de Arruda M.C.C., Sepulveda G.F.Ch., Miller R.N.G., Ferreira M.A.S.V., Santiago D.V.R., Resende M.L.V., Dianese J.C. & Felipe M.S.S. (2005) Crinipellis brasiliensis, a new species based on morphological and molecular data. Mycologia 97(6): 1348–1361. Bukhalo A.S. (1983) Crinipellis schevczenkovi Buchalo sp. nova – novij vid agarikalnogo griba. Ukr. Zhurn. Bot. 40(3): 98–99. Candusso M. (1986) Una nuova specie di Crinipellis. C. sardoa nov. sp. Boll. Gruppo Micol. Bres. 29(1–2): 25–34. Candusso M. (1991) El género Crinipellis. Bol. Soc. Micol. Madrid 15: 27–33. Cleland J.B. (1934) Toadstools and mushrooms and other larger fungi of South Australia. Part. I: 362 p. Adelaide, Handb. Fl. Fauna South Australia. Dennis R.W.G. (1958) Two species of Marasmius described by Hennings from South Brasil. Kew Bull. 1957/3: 395–396. Douanla-Meli C. & Langer E. (2008) Phylogenetic relationship of Marasmius mbalmayoensis sp. 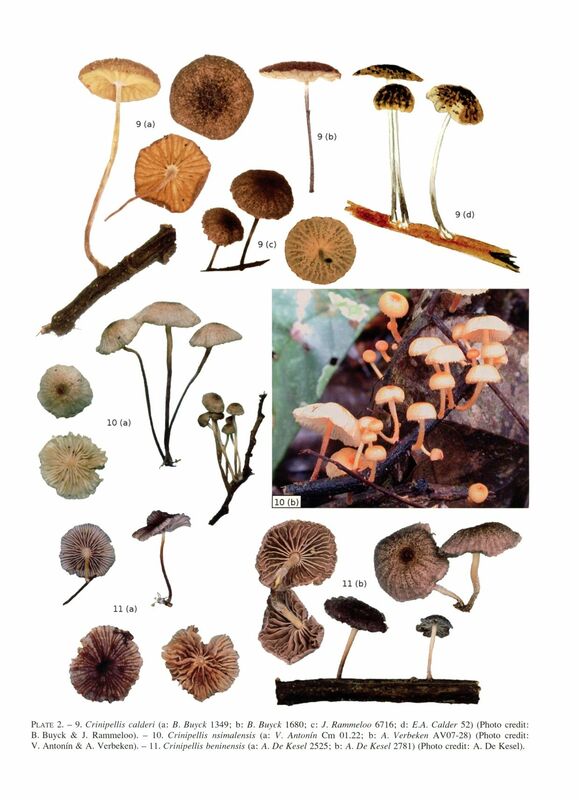 nov. to the tropical African Marasmius bekolacongoli complex based on nuc-LSU rDNA sequences. Mycologia 100(3): 445–454. Doyle M.F. (1987) The genus Crinipellis (Basidiomycetes, Agaricales, Tricholomataceae) in Illinois. Nova Hedwigia 44(3–4): 281–289. Halling R.E. (1993) Two new Crinipellinae (Tricholomataceae: Marasmiae) from South America. Mycotaxon 47: 379–385. Hennings P. (1897) Fungi camerunenses. II. Bot. Jahrb. Syst. 23: 537–558. Hennings P. (1901) Fungi camerunenses novi. III. Bot. Jahrb. Syst. 30: 39–57. Grgurinovic C.A. (1997) Larger fungi of South Australia: 725 p. Adelaide, Botanic Gardens of Adelaide and State Herbarium. Josserand M. (1965) Notes critiques sur quelques champignons de la région Lyonnaise (7e série). Bull. Soc. Mycol. Fr. 81: 517–565. Kerekes J.F. & Desjardin D.E. (2009) A monograph of the genera Crinipellis and Moniliophthora from Southeast Asia including a molecular phylogeny of the nrITS region. Fungal Divers. 37: 101–152. Kornerup A. & Wanscher J.H. (1983) Methuen handbook of colour. Ed. 3: 252 p. London, Methuen. Moncalvo J-M., Vilgalys R., Redhead S.A., Jonhnson J.E., James T.Y., Aime C., Hofstetter V., Verduin S.J.W., Larsson E., Baroni T.J., Thorn R.G., Jacobsson S., Clémençon H. & Miller O.K. jr. (2002) One hundred and seventeen clades of euagarics. Molecular Phylogenetics Evol. 23: 357–400. Morris B. (1990) An annotated check-list of the macrofungi of Malawi. Kirkia 13(2): 323–364. Murrill W.A. (1915) Crinipellis Pat. North Amer. Fl. 9(4): 287–288. Patouillard N. (1892) Champignons nouveaux extra-européens. Bull. Soc. Mycol. Fr. 8: 46–56. Patouillard N. (1895) Quelques espèces nouvelles de champignons africains. Bull. Soc. Mycol. Fr. 11: 85–88. Patouillard N. (1924) Basidiomycètes nouveaux de Madagascar. Bull. Mus. Nat. Hist. Natur. 30: 406–413 & 526–532. Pegler D.N. (1966) Tropical African Agaricales. Persoonia 4: 73–124. Pegler D.N. (1968) Studies on African Agaricales: I. Kew Bull. 21: 499–533. Pegler D.N. (1977) A preliminary agaric flora of East Africa. Kew Bull., Addit. Ser. 6: 1–615. Pegler D.N. (1978) Crinipellis perniciosa (Agaricales). Kew Bull. 32(4): 371–376. Pegler D.N. (1983) The genus Lentinus: a world monograph. Kew Bull., Addit. Ser. 10: 1–281. Redhead S.A. (1986) The genus Crinipellis Pat. in Canada. In Borghi E. (ed. ), La Famiglia delle Tricholomataceae. Atti del Convegno Internazionale del 10-15 settembre 1984. Borgo Val di Taro – Italy. Atti del Centro Studi per la Flora Mediterranea 6: 175–199. Redhead S.A. (1989) The presence of Crinipellis maxima (Tricholomataceae) in Canada. Mem. New York Bot. Gard. 49: 187–191. Redhead S.A. & Liu B. (1982) New species and new records of Tricholomataceae (Agaricales) from China. Can. J. Bot. 60: 1479–1486. Shaffer R.L. & Weaver M.G. 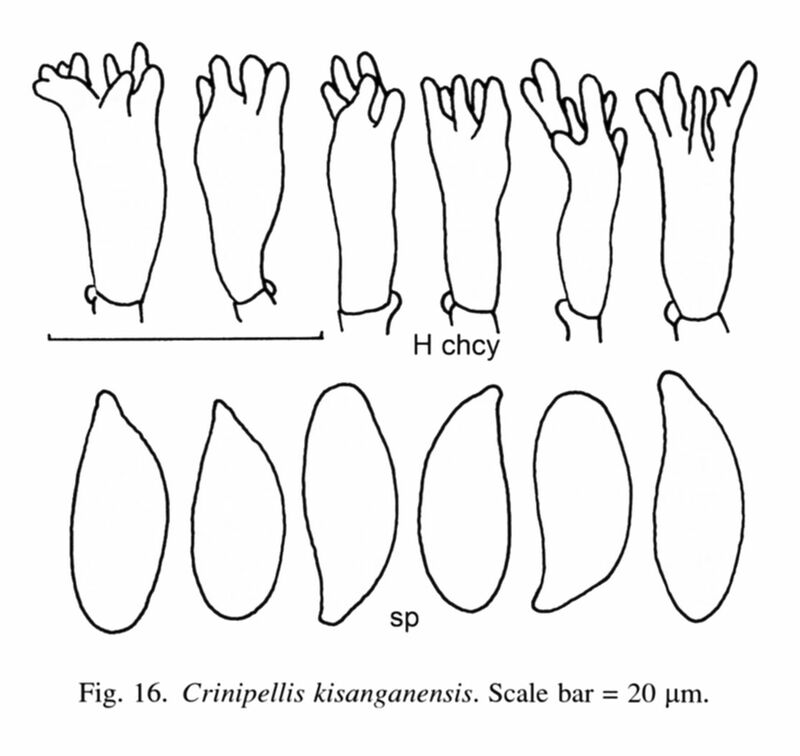 (1965) A new species of Crinipellis. Mycologia 57: 472–475. Singer R. (1943) A monographic study of the genera Crinipellis and Chaetocalathus. Lilloa 8(1942): 441–534. Singer R. (1976) Marasmieae (Basidiomycetes – Tricholomataceae). Fl. Neotrop. 17: 1–348. 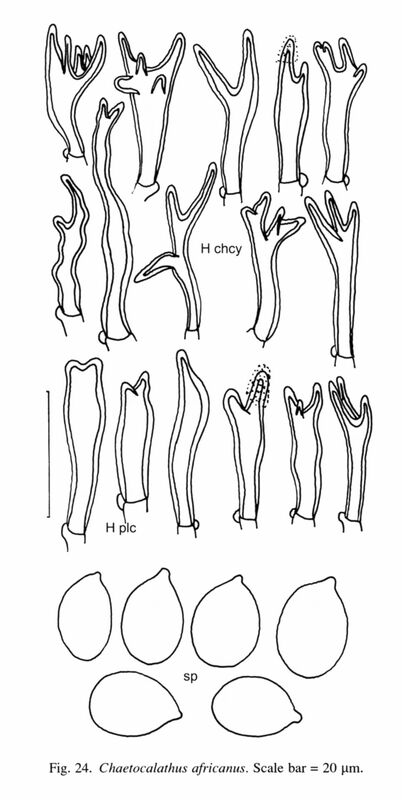 Singer R. (1986) The Agaricales in modern taxonomy. 4th ed. : 981 p., 88 pl. Koenigstein, Koeltz. Singer R. & Grinling K. (1967) Some Agaricales from the Congo. Persoonia 4(4): 355–377. Stevenson G. (1964) The Agaricales of New Zealand: V. Kew Bull. 19(1): 1–59. Takahashi H. (2000) Three new species of Crinipellis found in Iriomote Island, southwestern Japan, and central Honshu, Japan. Mycoscience 41: 171–182. 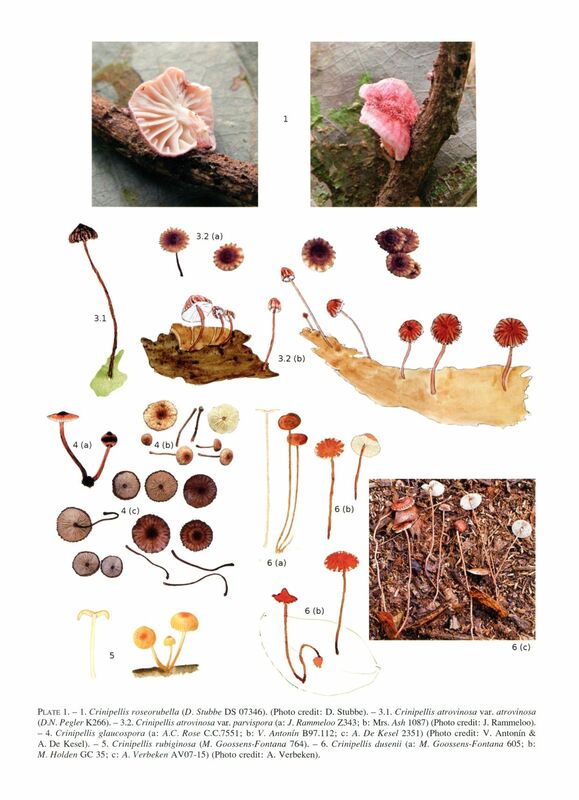 Takahashi H. (2011) Two new species of Agaricales and a new Japanese record for Chaetocalathus fragilis from Ishigaki Island, a southwestern island of Japan. Mycoscience 52: 392–400. Vizzini A., Antonín V. & Noordeloos M.E. (2007) Crinipellis pedemontana sp. nov. (Agaricomycetes), a new basidiomycete from Italy. Mycologia 99(5): 786–791. Wilson A.W., Desjardin D.E. 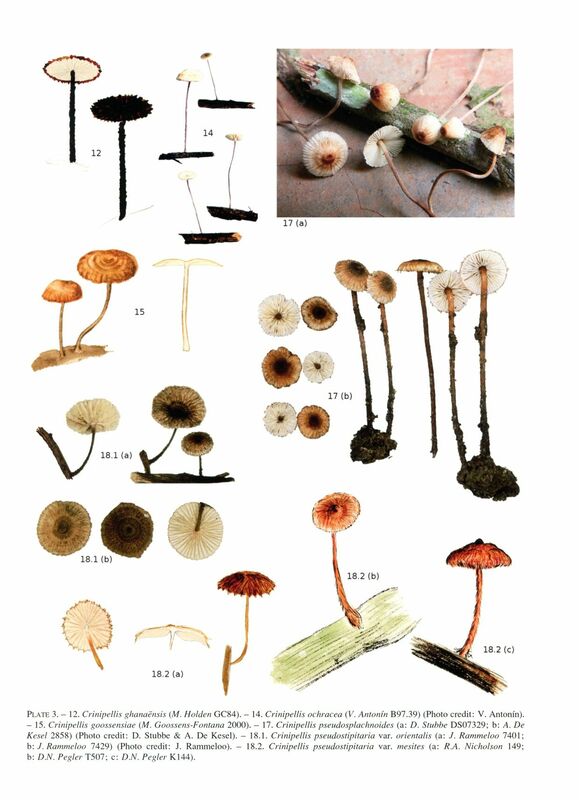 & Horak E. (2004) Agaricales in Indonesia. 5. The genus Gymnopus from Java and Bali. Sydowia 56(1): 137–210. Accepted names are bold, synonyms are in normal font. Plate 1. – 1. Crinipellis roseorubella (D. Stubbe DS 07346). (Photo credit: D. Stubbe). – 3.1. Crinipellis atrovinosa var. atrovinosa (D.N. Pegler K266). – 3.2. Crinipellis atrovinosa var. parvispora (a: J. Rammeloo Z343; b: Mrs. Ash 1087) (Photo credit: J. Rammeloo). – 4. Crinipellis glaucospora (a: A.C. Rose C.C.7551; b: V. Antonín B97.112; c: A. De Kesel 2351) (Photo credit: V. Antonín & A. De Kesel). – 5. Crinipellis rubiginosa (M. Goossens-Fontana 764). – 6. Crinipellis dusenii (a: M. Goossens-Fontana 605; b: M. Holden GC 35; c: A. Verbeken AV07-15) (Photo credit: A. Verbeken). Plate 2. – 9. 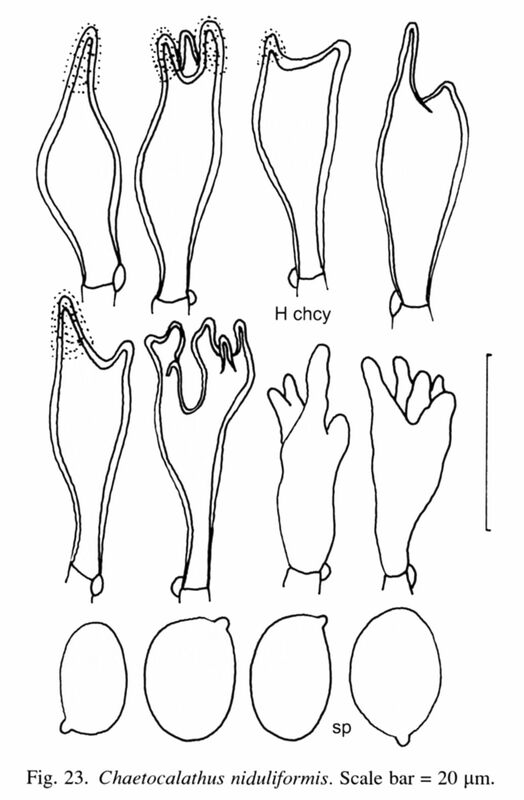 Crinipellis calderi (a: B. Buyck 1349; b: B. Buyck 1680; c: J. Rammeloo 6716; d: E.A. Calder 52) (Photo credit: B. Buyck & J. Rammeloo). – 10. Crinipellis nsimalensis (a: V. Antonín Cm 01.22; b: A. Verbeken AV07-28) (Photo credit: V. Antonín & A. Verbeken). – 11. Crinipellis beninensis (a: A. De Kesel 2525; b: A. De Kesel 2781) (Photo credit: A. De Kesel). Plate 3. – 12. Crinipellis ghanaënsis (M. Holden GC84). – 14. Crinipellis ochracea (V. Antonín B97.39) (Photo credit: V. Antonín). – 15. Crinipellis goossensiae (M. Goossens-Fontana 2000). – 17. 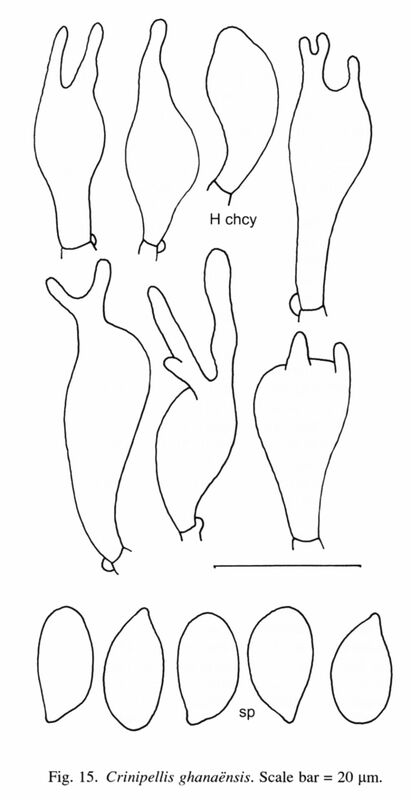 Crinipellis pseudosplachnoides (a: D. Stubbe DS07329; b: A. De Kesel 2858) (Photo credit: D. Stubbe & A. De Kesel). – 18.1. Crinipellis pseudostipitaria var. orientalis (a: J. Rammeloo 7401; b: J. Rammeloo 7429) (Photo credit: J. Rammeloo). – 18.2. Crinipellis pseudostipitaria var. mesites (a: R.A. Nicholson 149; b: D.N. Pegler T507; c: D.N. Pegler K144). Plate 4. – 1. 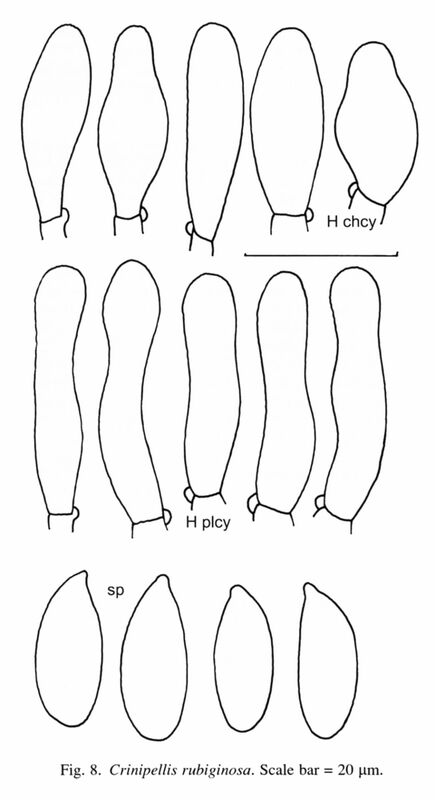 Chaetocalathus niduliformis (a: D. Stubbe DS07331; b: R.A. Nicholson 85; c: R.A. Nicholson 207; d: J. Rammeloo 6713) (Photo credit: J. Rammeloo). – 2. 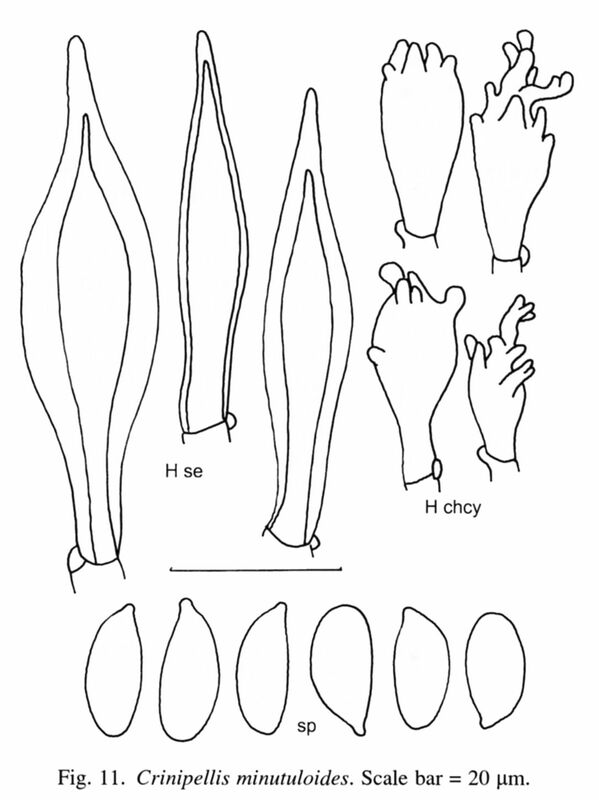 Chaetocalathus africanus (a: A.C. Rose CC2; b: A. Verbeken AV07-03; c: D. Stubbe DS07336) (Photo credit: A. Verbeken & D. Stubbe). – 3. 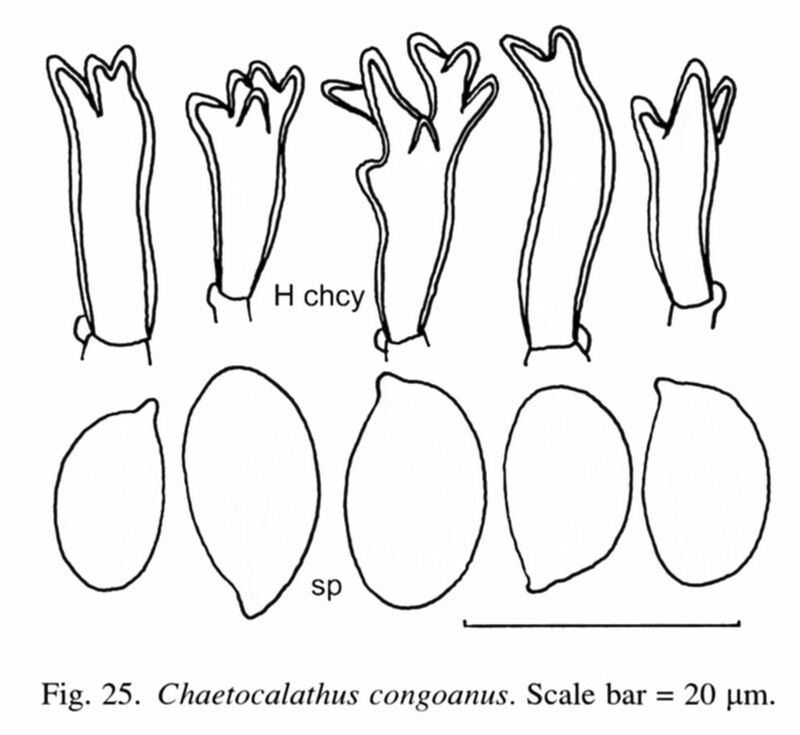 Chaetocalathus congoanus (J. Dybowski s.n.). Fig. 1. Pileus and stipe hairs of Crinipellis and Chaetocalathus. Fig. 2. Crinipellis glaucospora. Pileus hairs in H2O (left), becoming green-blue in KOH (right). The green-blue colouration is more distinct in a thicker layer of hairs. Fig. 3. Crinipellis minutula. Pileus hairs in H2O (left) and in KOH (right). Fig. 4. Crinipellis roseorubella. Scale bar = 20 µm. Fig. 5. Crinipellis palmarum. Scale bar = 20 µm. Fig. 6. Crinipellis atrovinosa. (a) var. atrovinosa, (b) var. parvispora. Scale bar = 20 µm. Fig. 7. Crinipellis glaucospora. Scale bar = 20 µm. Fig. 8. Crinipellis rubiginosa. Scale bar = 20 µm. Fig. 9. Crinipellis dusenii. Scale bar = 20 µm. Fig. 10. Crinipellis pseudopalmarum. Scale bar = 20 µm. Fig. 11. Crinipellis minutuloides. Scale bar = 20 µm. Fig. 12. Crinipellis calderi. Scale bar = 20 µm. Fig. 13. Crinipellis nsimalensis. Scale bar = 20 µm. Fig. 14. Crinipellis beninensis. Scale bar = 20 µm. Fig. 15. Crinipellis ghanaënsis. Scale bar = 20 µm. Fig. 16. Crinipellis kisanganensis. Scale bar = 20 µm. Fig. 17. Crinipellis ochracea. Scale bar = 20 µm. Fig. 18. Crinipellis goossensiae. Scale bar = 20 µm. Fig. 19. Crinipellis minutula. Scale bar = 20 µm. Fig. 20. Crinipellis pseudosplachnoides. Scale bar = 20 µm. Fig. 21. Crinipellis pseudostipitaria. (a) var. orientalis, (b) var. mesites. Scale bar = 20 µm. Fig. 22. Crinipellis pseudostipitaria (revision of types). (a) var. orientalis, (b) var. mesites. Scale bar = 20 µm. Fig. 23. Chaetocalathus niduliformis. Scale bar = 20 µm. Fig. 24. Chaetocalathus africanus. Scale bar = 20 µm. Fig. 25. Chaetocalathus congoanus. Scale bar = 20 µm.